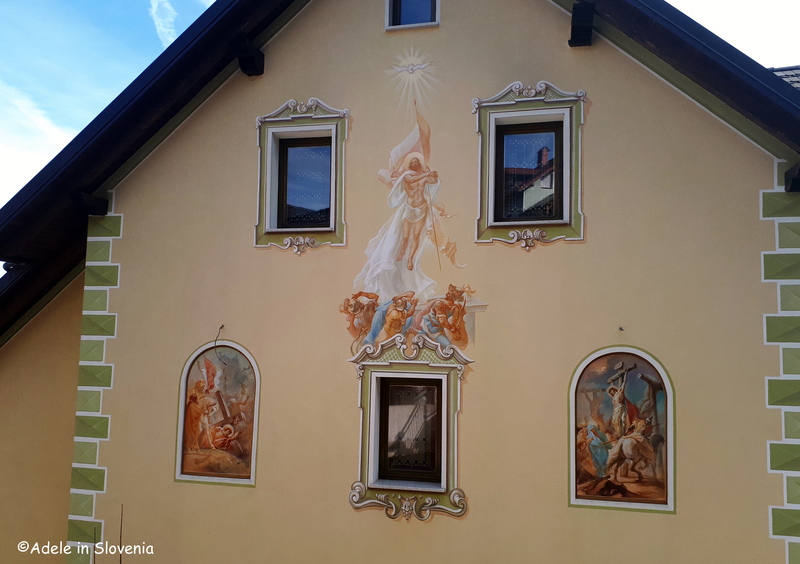 The village of Ljubno might be small but its numerous beautifully frescoed houses and ‘miraculous’ church are a real feast for the eyes! 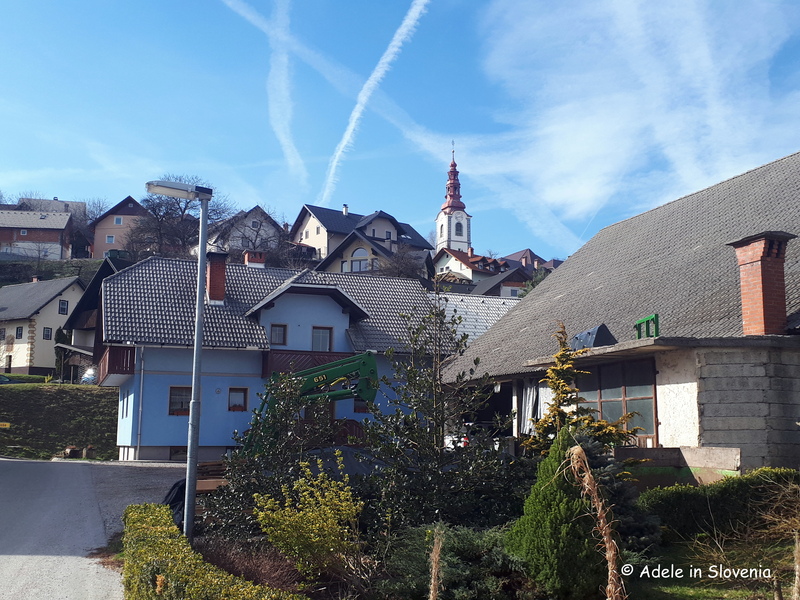 When driving along the Gorenjska motorway from east to west, just before reaching the Ljubno tunnel, to the left you can see the village and its closely-packed houses. However, its not until you get up close and take a walk among the houses, that you get a true sense of this small village. Ljubno was once a centre of pottery in the Gorensjka region. 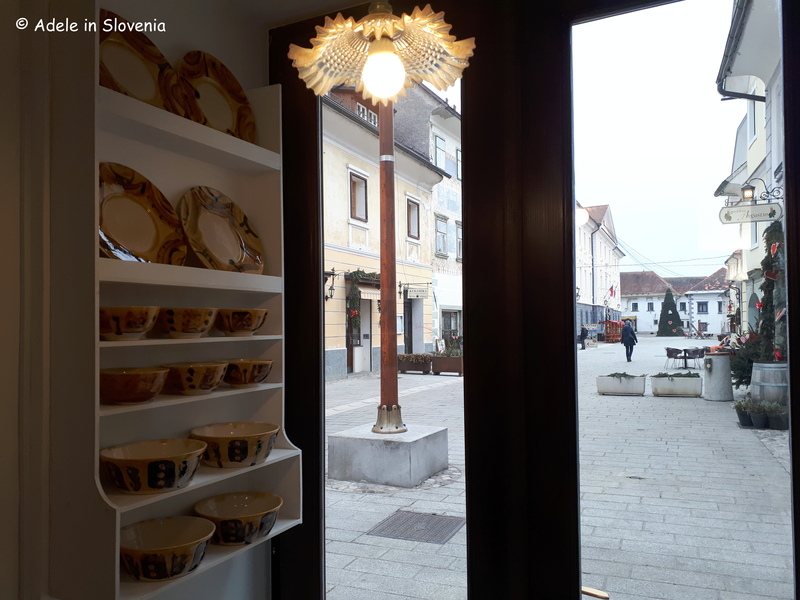 Today you can find out more about the tradition and see examples of Ljubno pottery at the Manufaktura pottery shop and workshop in Radovljica’s old town centre – https://adeleinslovenia.com/2019/01/05/manufaktura-a-new-year-and-a-new-addition-to-radovljicas-linhart-square/. There is an interesting story of how Ljubno was transformed into an important pilgrimage place in the 17th century. 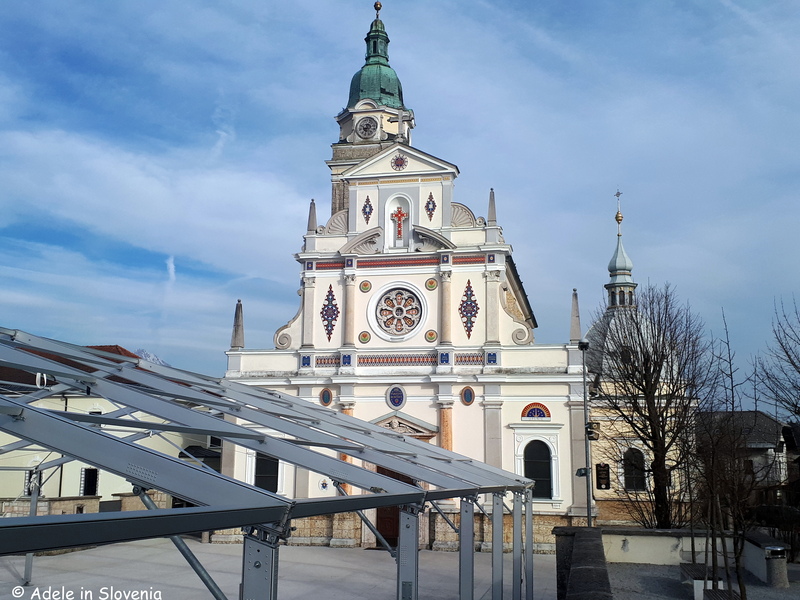 During renovation of Ljubno’s village church – the Church of Mary Help of Christians, also known as the Church of the ‘Stricken’ Mary – a builder struck the statue of Mary and blood poured out of the ‘wound’ and wouldn’t stop. The story quickly became known throughout the land and attracted ever more pilgrims. Today it is not as popular as nearby Brezje, however, when in the area, it is still worth a visit. 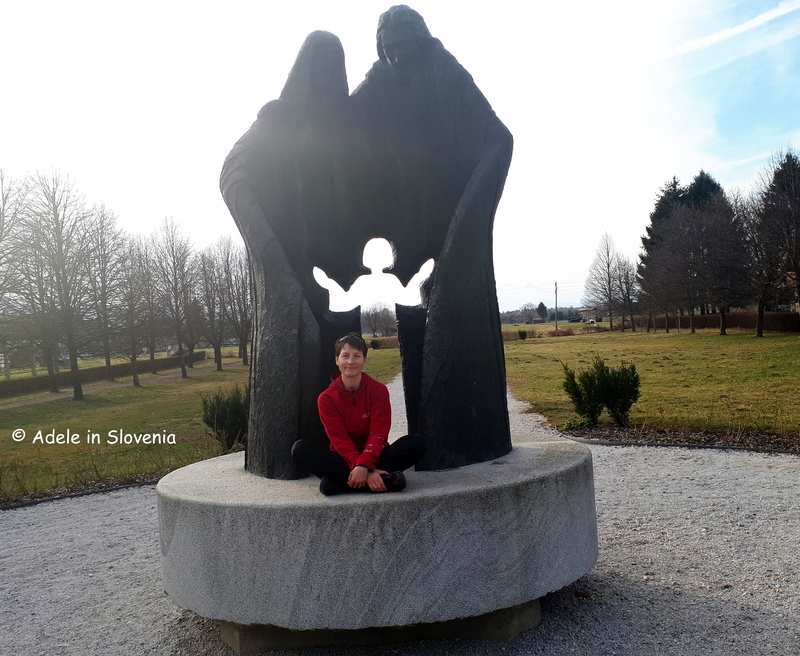 A visit to Ljubno can be an extension of a walk along the Brezje Pilgrimage Trail (Božja pot), which today runs along the once most commonly used pilgrimage trail from Otoče to the Basilica of Mary Help of Christians in Brezje. 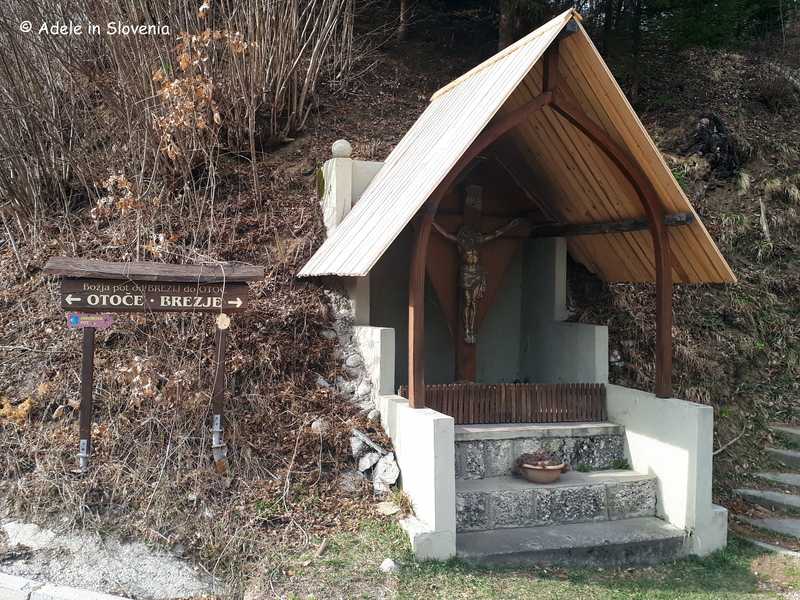 There is an information board (in Slovene) about the trail adjacent to the church. 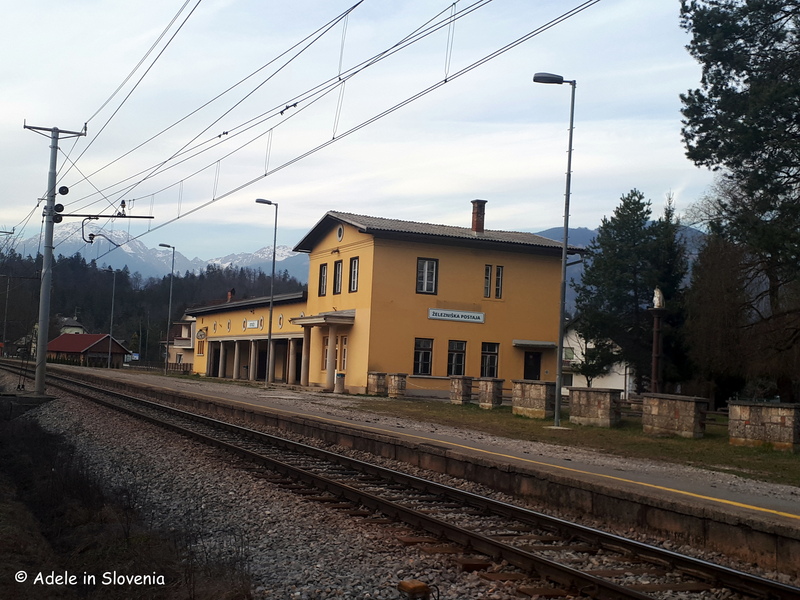 The path in Otoče begins at the railway station, hence making it ideal for those reliant on public transport. 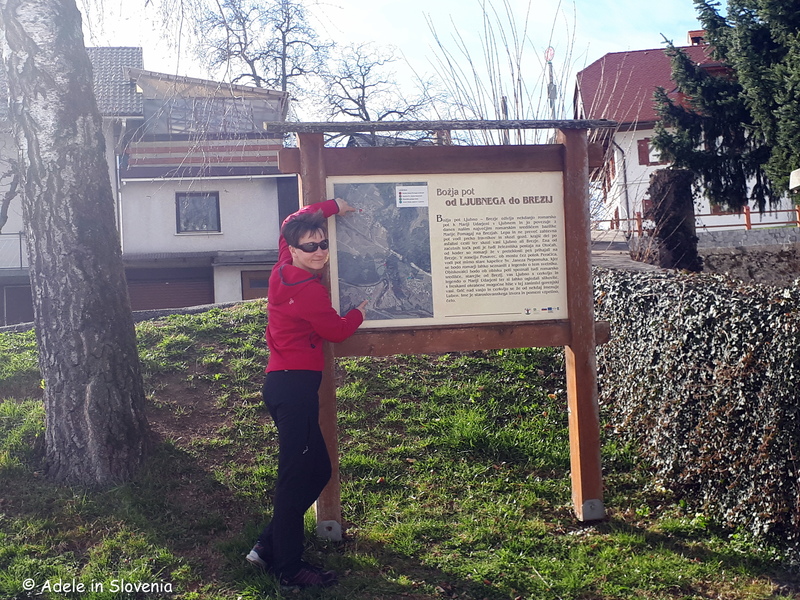 Immediately on leaving the station you will find the first information board about the trail (in Slovene). First walk along the village road to the junction with the main road and turn left. 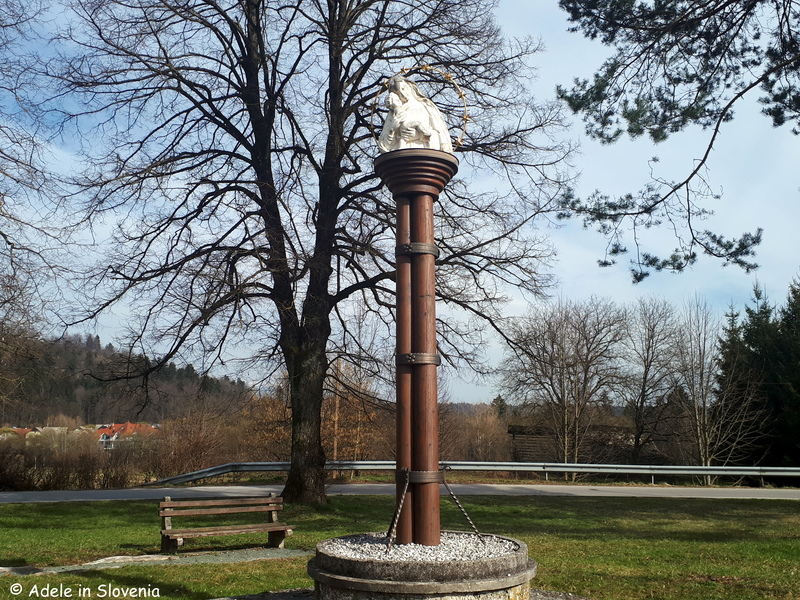 After just a few metres you can choose to follow the marked path to make a detour to Ljubno, or take the direct route to Brezje. If you opt for the latter, which is cca. 5kms one-way, continue along the verge of the road for a further cca. 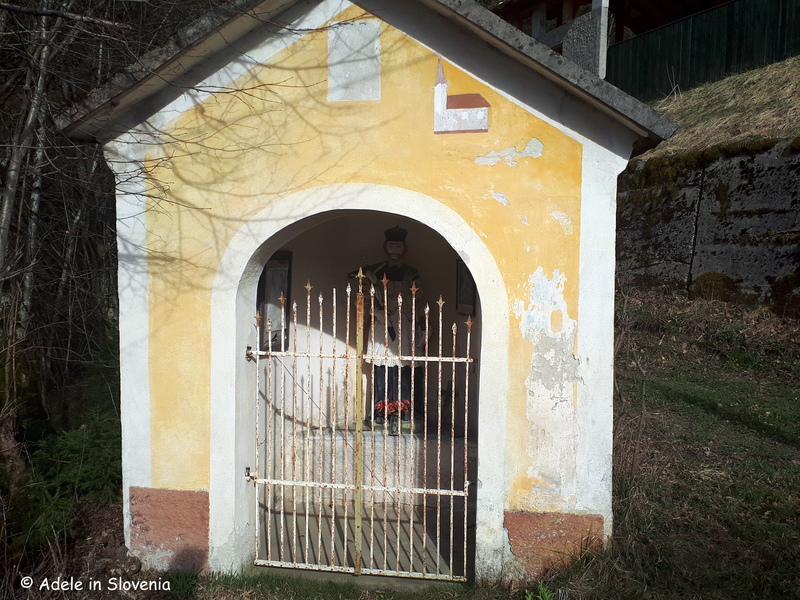 5 mins until you reach the shrine of St. John of Nepomuk (kapelica sv. Janeza Nepomuka). After crossing the bridge over a stream take the wooden steps to the right of another shrine that lead up steeply on a forest path. On emerging from the forest head towards the underpass under the motorway. 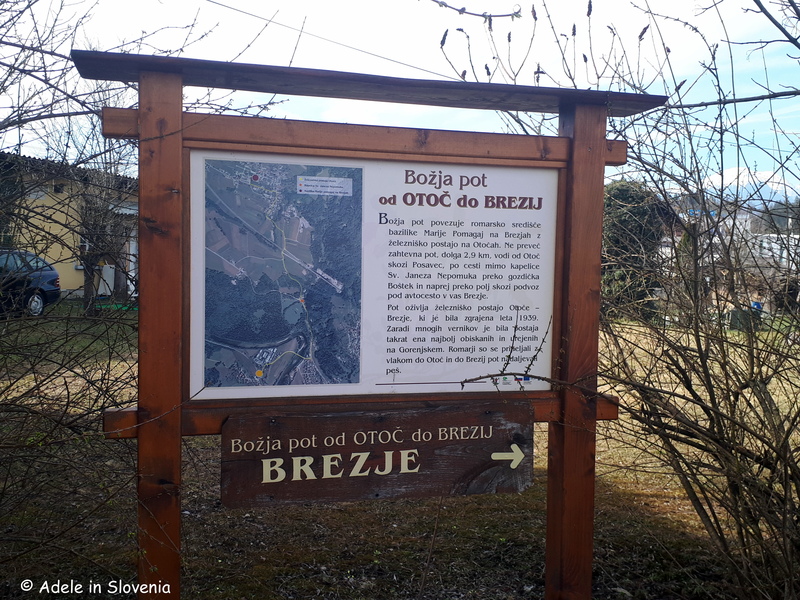 Shortly thereafter you will see the sign for the village of Brezje. Follow the road up a short incline into the village and then just ‘follow your nose’ to the basilica, you can’t exactly miss it! In 1988 the then Church of St. Vitus was elevated to the status of minor basilica by Pope John Paul II, who also visited in 1996. 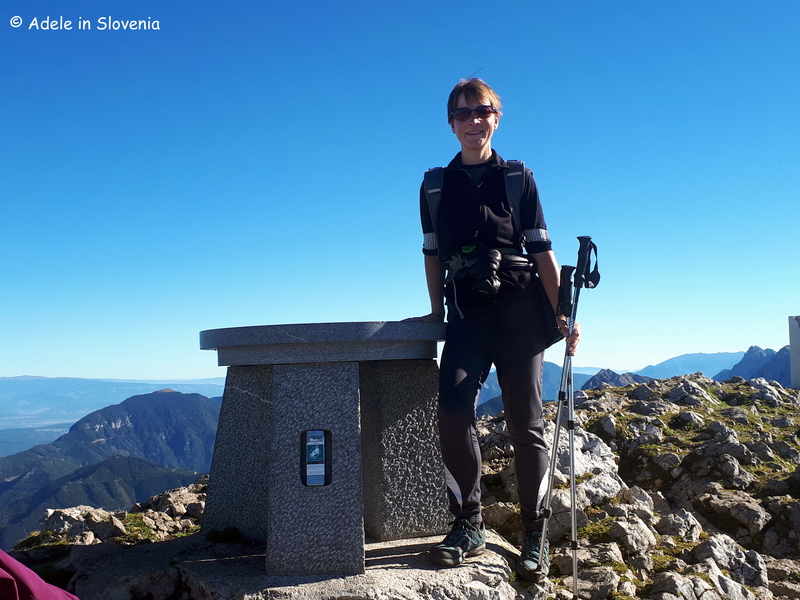 The basilica has become a popular pilgrimage destination to where people flock from all over Slovenia and further afield, too, particularly on Assumption Day, which is celebrated on 15th August and is a public holiday in Slovenia. 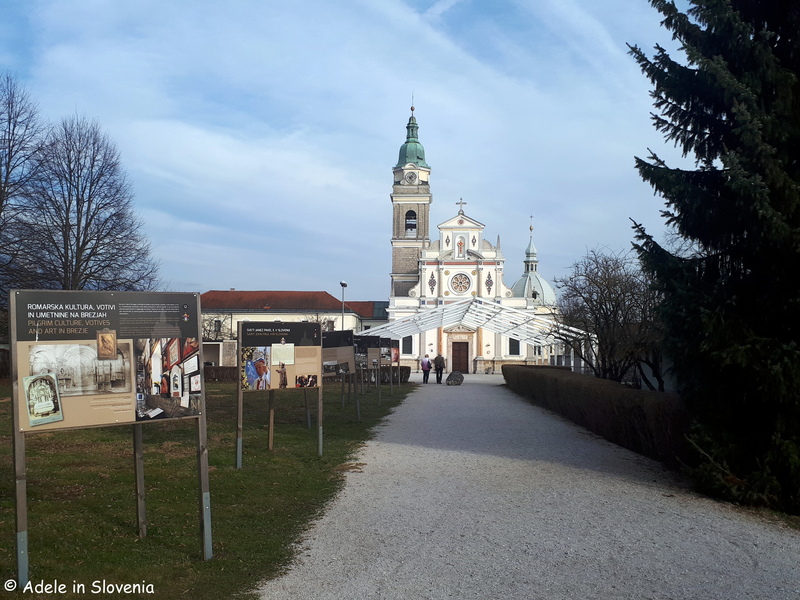 Opposite the basilica there is a small park where you can sit in peace and admire the basilica, read the information boards about Brezje’s history, and soak up the views of the surrounding countryside and mountains. You don’t need to be a pilgrim, or even to be particularly religious, to enjoy a walk along the trail; it’s just one of the many attractions in the Radol’ca area. 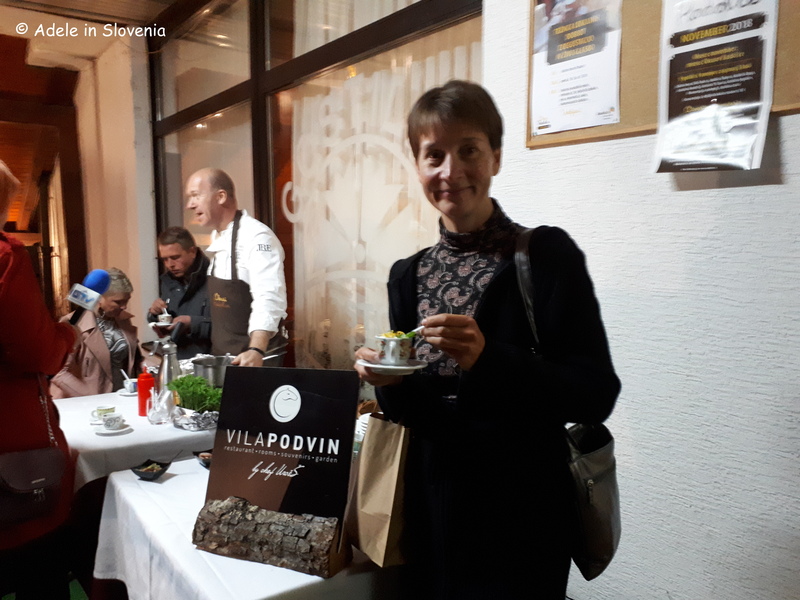 Click here to see even more, oh and by the way, if you happen to be in the area in April, or are planning a visit and are pondering when to come, don’t miss the Radovljica Chocolate Festival from 12th-14th April, about which I will, of course, be writing (and eating!) more soon! 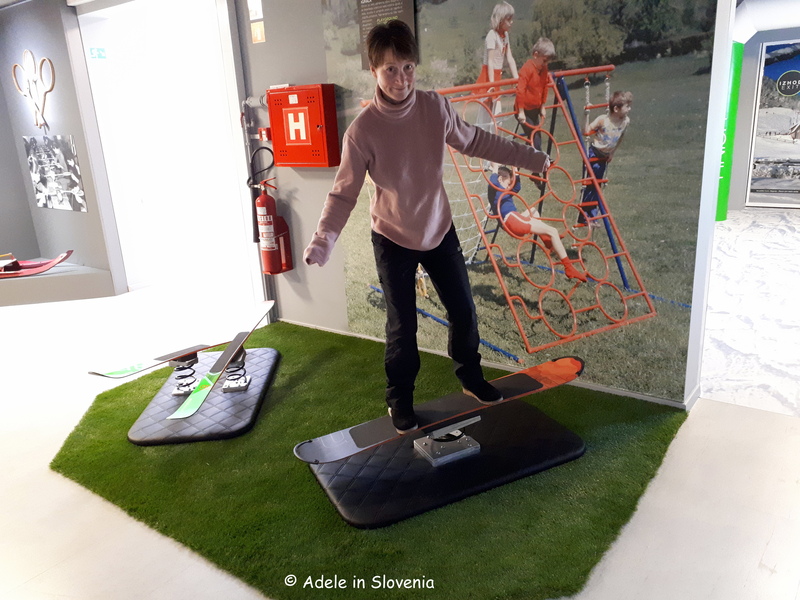 Test Your Skiing Skills at the Elan Alpine Skiing Museum! 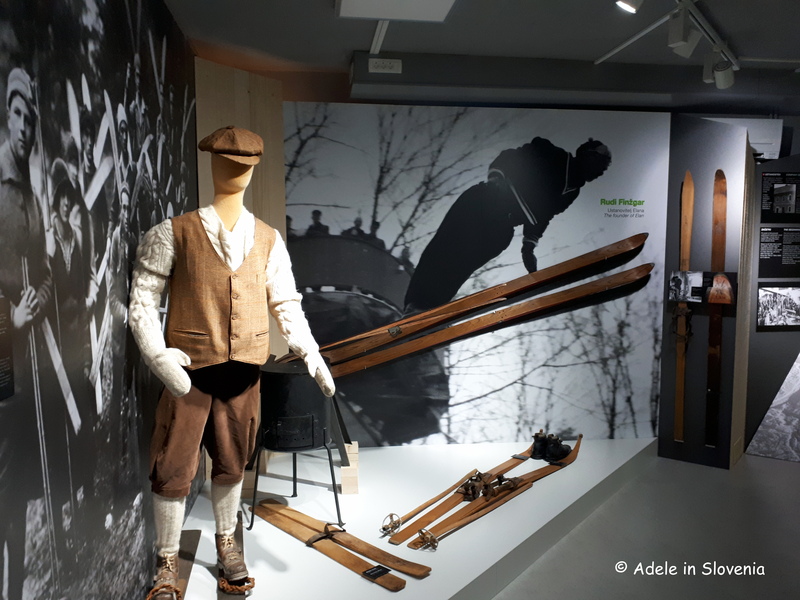 The Radol’ca area is synonymous with Elan – the world-famous producer of skis, and now you can find out more about the company’s history and innovative products whilst enjoying some interactive fun at the new Elan Alpine Skiing Museum. 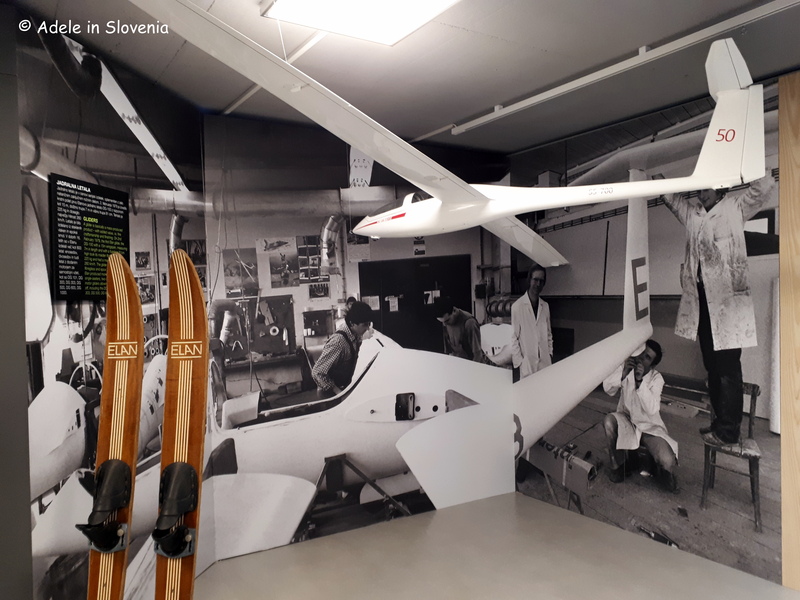 The museum is located at the company’s production unit in Begunje na Gorenjskem, just a short distance from Radovljica. 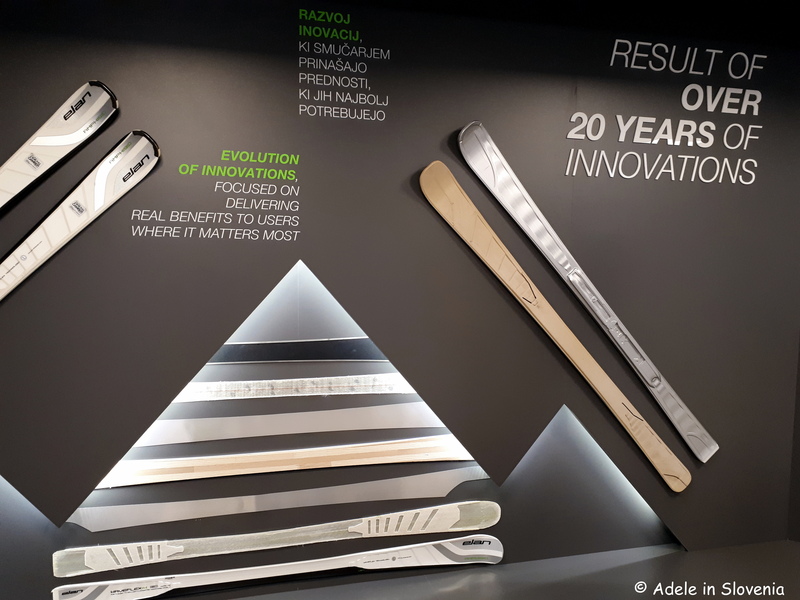 It was opened in 2018 by the legendary Swedish skier Ingemar Stenmark, who competed using Elan skis throughout his entire career. 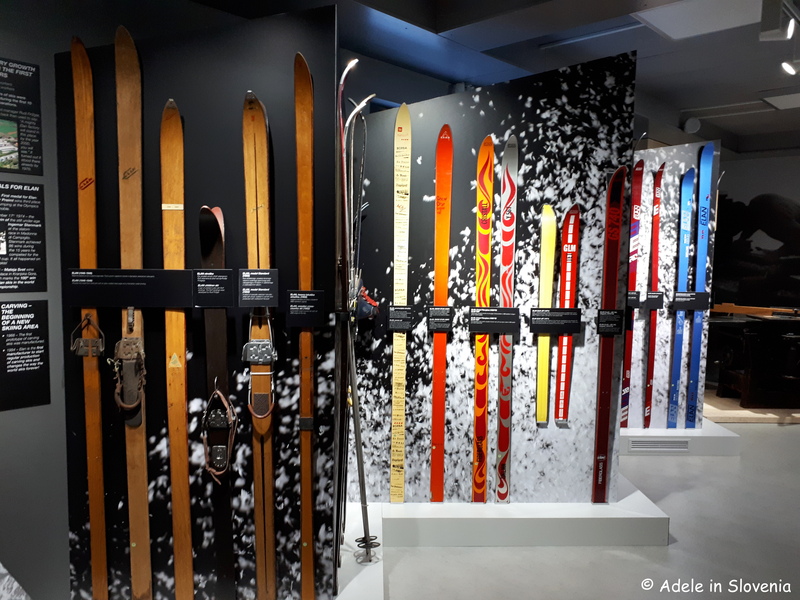 The first pair of skis on which Stenmark competed in World Cup races is among the museum’s exhibits. 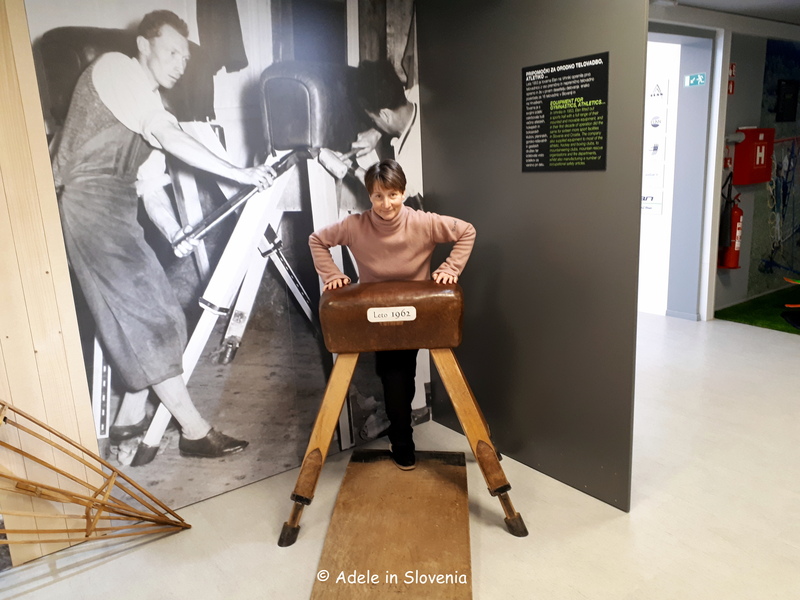 Elan was established in 1945 upon the initiative of the ski jumper and ski maker Rudi Finžgar (1920-1955) who in 1941, despite being young and inexperienced, became the first Slovenian ski jumper to jump over 100 metres. The company quickly became known for its innovative and trend-setting designs. 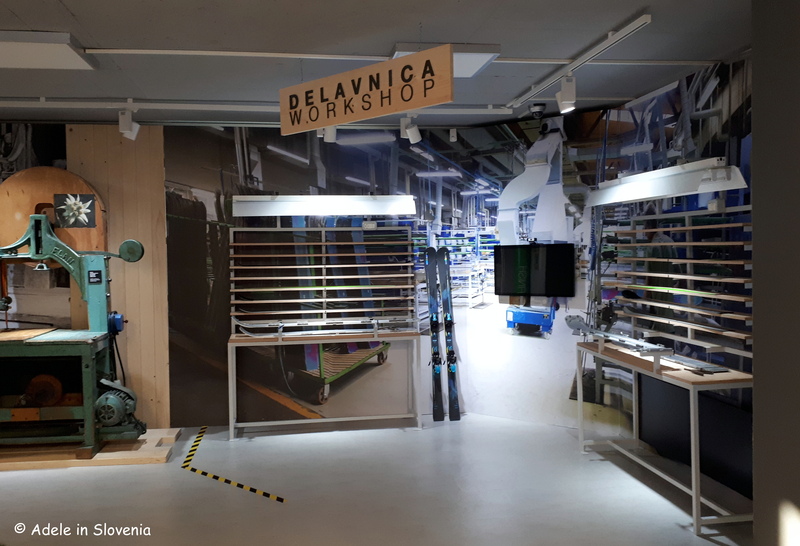 There are also exhibits showing some of the achievements of the company’s other divisions, including boats, aeroplanes, sports equipment and wind turbines. 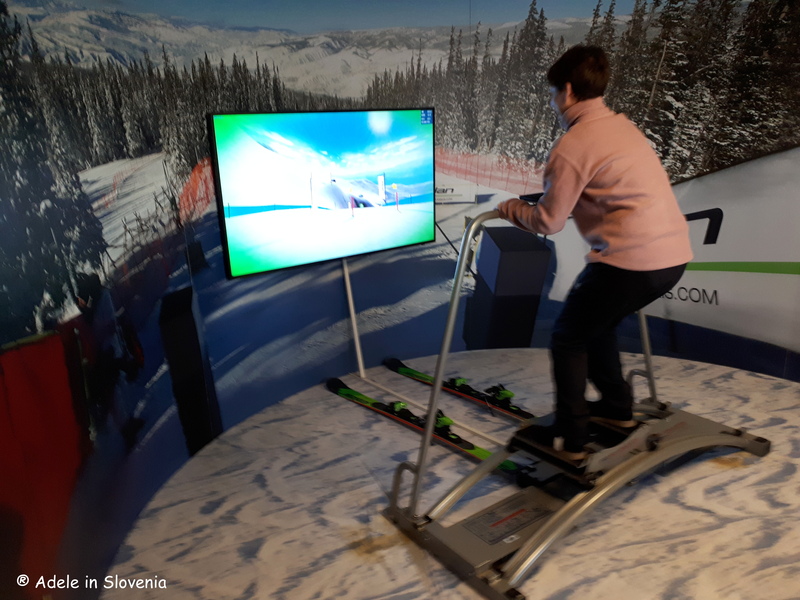 …and there is a chance to test your skills and get interactive on the ski simulator. Needless to say, I didn’t score top marks but it was fun having a go nonetheless and a pretty good workout too! 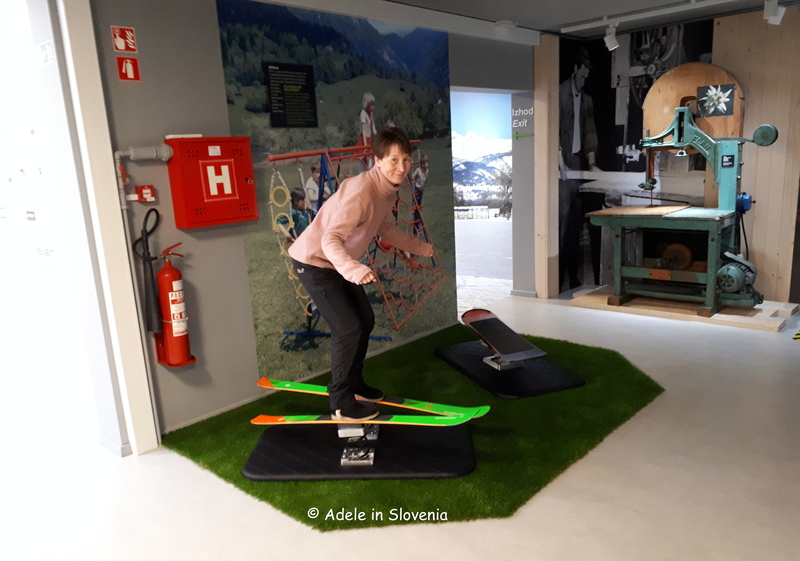 The museum is open Tuesdays – Saturdays from 10am-6pm and offers a great experience for all the family, even for non-skiers like me! Adjoining the museum is the Elan Sports Shop, which is crammed with sports apparel, both Elan’s own-brand products and other brand names, which you can access from outside or alternatively once you make it past the finish line! 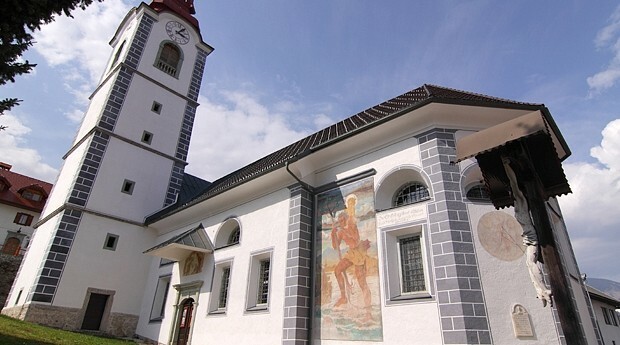 Whilst in the area you can also visit the many other numerous attractions and sights of interest in the village of Begunje na Gorenjskem and its surroundings, among them Kamen Castle, the Avsenik Museum, Katzenstein Mansion and the Museum of Hostages and two Taste Radol’ca restaurants – Gostišče Draga and Gostilna Pr’Tavčar. 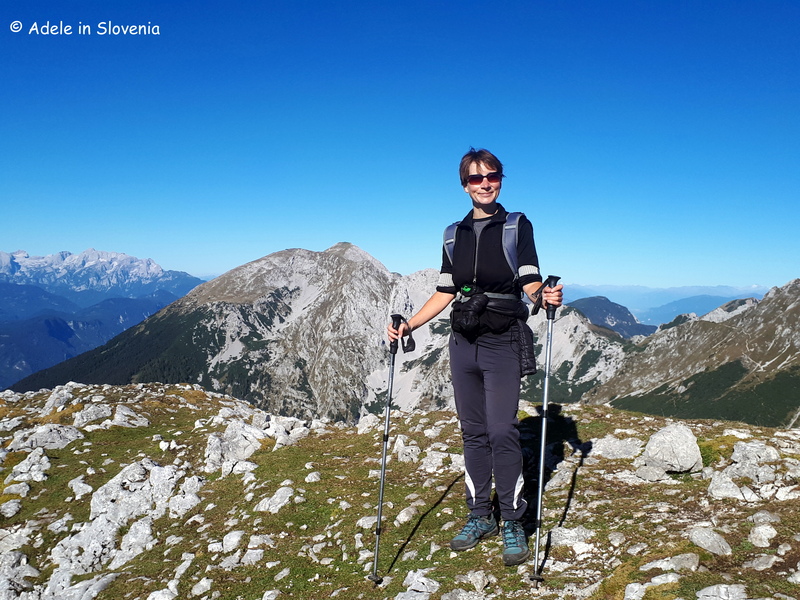 If you want to get active then you can take a walk on the St. Peter’s Trail, the Begunje Village Trail or visit the Draga Valley from where you can set off on hikes in the Karavanke mountains. 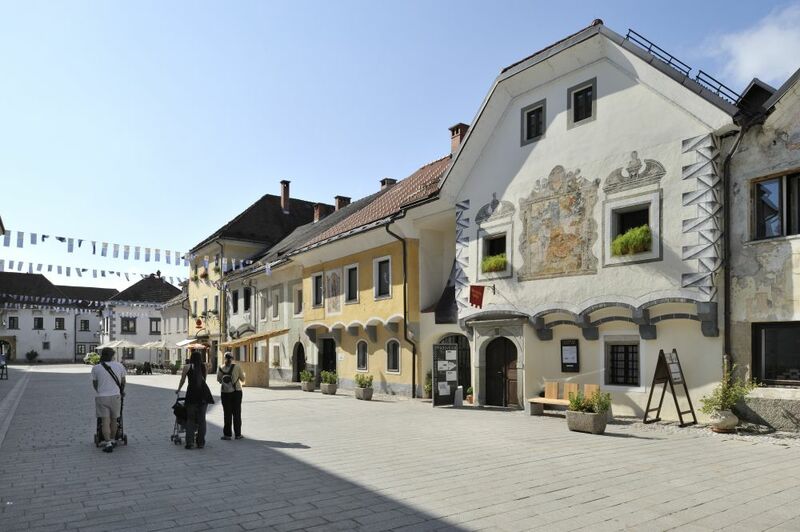 Linhart Square is the compact, quaint heart of Radovljica’s historic old town. 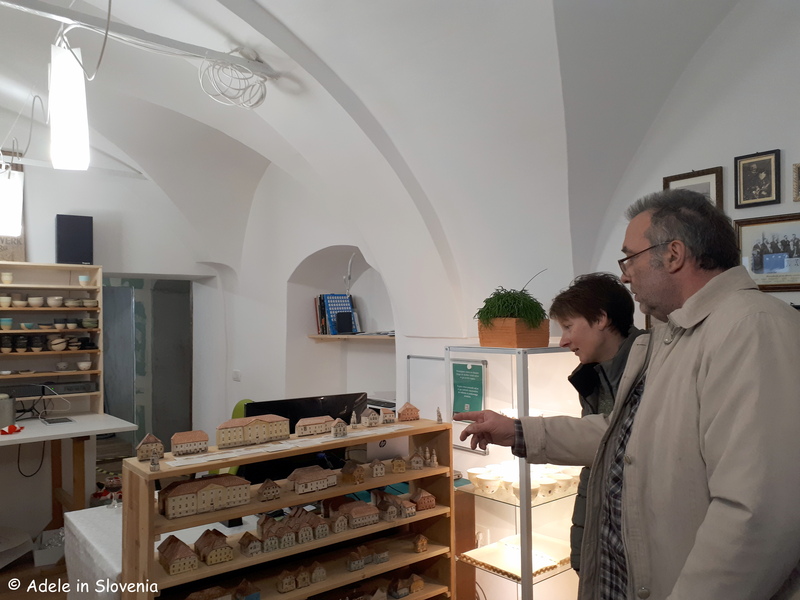 As of today, in addition to the numerous frescoed bourgeois houses, the gothic St. Peter’s church, and the magnificent Radovljica Mansion, the square has become even richer for the opening of the new Manufaktura ceramics shop and workshop. As well as being a very welcome addition to the old town, Manufaktura has an important story of heritage; the building was originally bought by the Magušar family’s great grandfather 150 years ago, and the ceramics and owners of Keramika, Oli and Urban Magušar, assisted by their son Jeron, have now repurchased, renovated and brought it back to life. Oli talked me through the photos of their ancestors; a wonderful tale and a wonderful addition to Linhart Square. 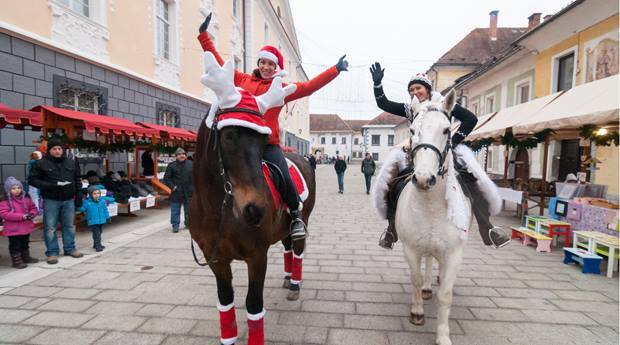 Personally I’m delighted to see such an opening, since many of Slovenia’s historic old town centres have fallen victim of the large, out-of-town, generic shopping centres, which are dominated by the same chain stores wherever you go. Slovenia already has the highest number of shops per head in Europe (if not further afield too! ), yet more ghastly shopping centres are still springing up at a rate of knots and, unfortunately, Radovljica is not immune to this either, with a new shopping centre currently being developed at the entrance to the town. I’m so anti these kinds of developments, especially when there are already way too many shops for the population of 2 million; shopping seems to have become a national obsession, sadly. 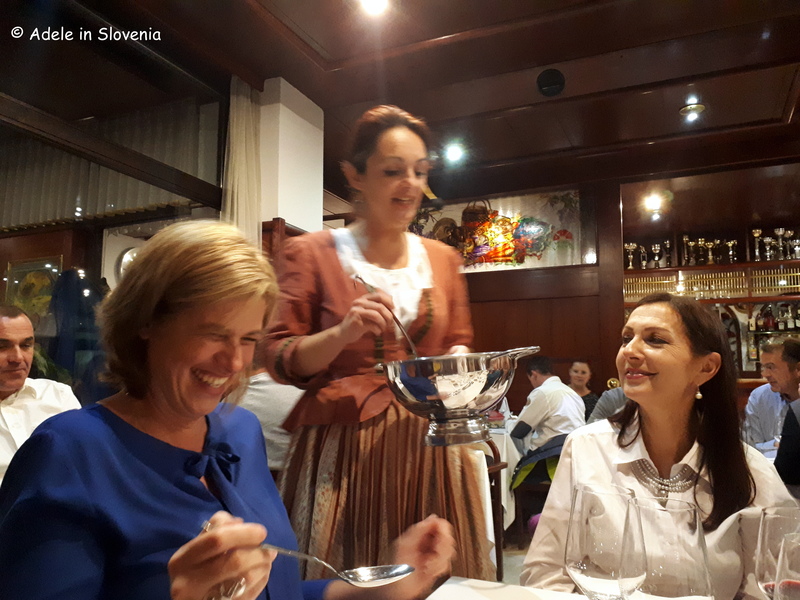 Hence, shops such as Manufaktura really do play an important part in maintaining Slovenia’s heritage and traditions, and we must support them by buying locally to ensure they can be sustained. And judging from the crowds at today’s opening, it seems I’m not alone in my delight and enthusiasm! The building features an area where traditional Magušar bowls and other handmade ceramics and accessories can be bought, including the new range of mini replicas of the houses in Radovljica’s old town centre, which adorned the Christmas tree this year in Radovljica Mansion and which make great souvenirs. Part of the room has been allocated to enable visitors to watch the ceramists at work. 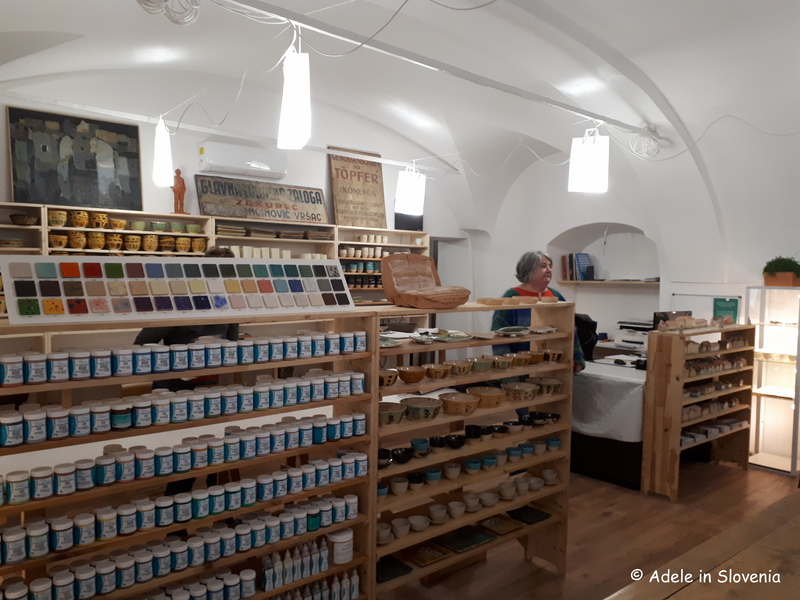 The other room, with its beautiful tiled floor, has a display of 150 different kinds of clay and their properties, various implements, and there are plans for a museum too. 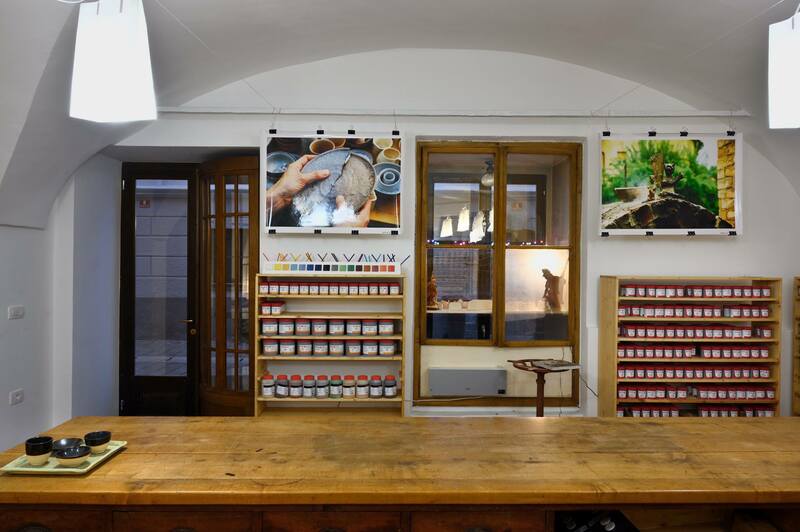 Manufaktura is open on Mondays-Fridays from 10am-1pm and 2pm-4pm, on Wednesdays until 7pm, as well as on the first Saturday of the month. A website is coming but for now, should you want further information, you can contact them through the Glinca Facebook page or, of course, drop into the shop itself! 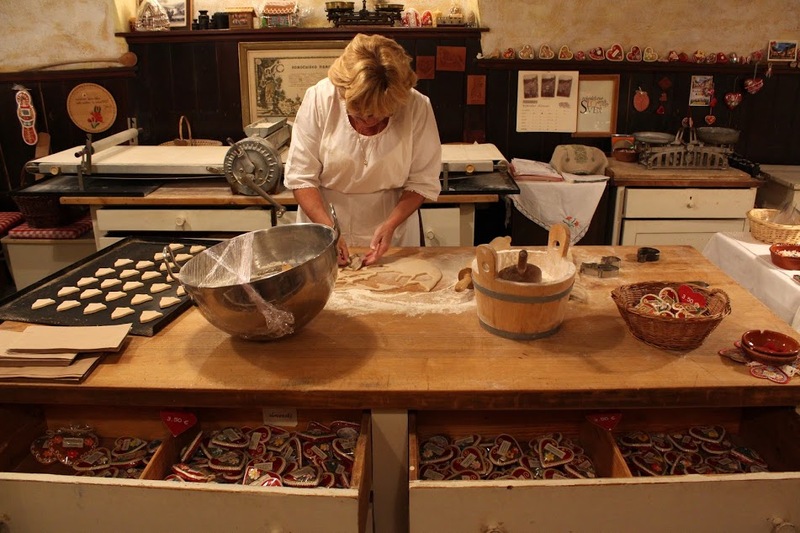 Among the other main highlights of Radovljica’s old town centre is the Lectar Honeybread Museum and Workshop, which is located in the cellar of Gostilna Lectar, a family-run restaurant and guest house with a tradition dating back to 1766. The Šivec House Gallery, which is the place to be for all art lovers. 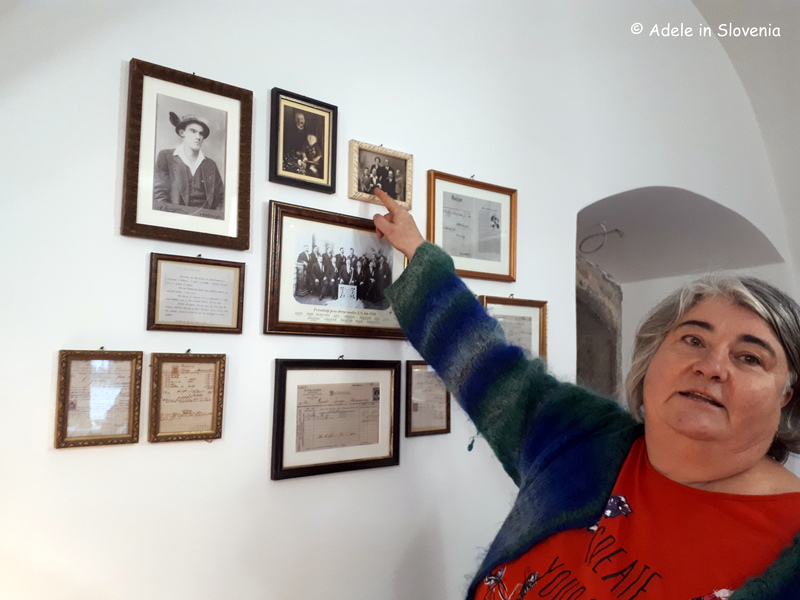 One part of the gallery is dedicated to a permanent exhibition of original illustrations, whilst the other hosts monthly exhibitions by fine Slovenian and foreign artists, and upstairs there is a room used for civil wedding ceremonies. The building itself it also notable for its exterior fresco and the unusual layout and architecture of its preserved interior. 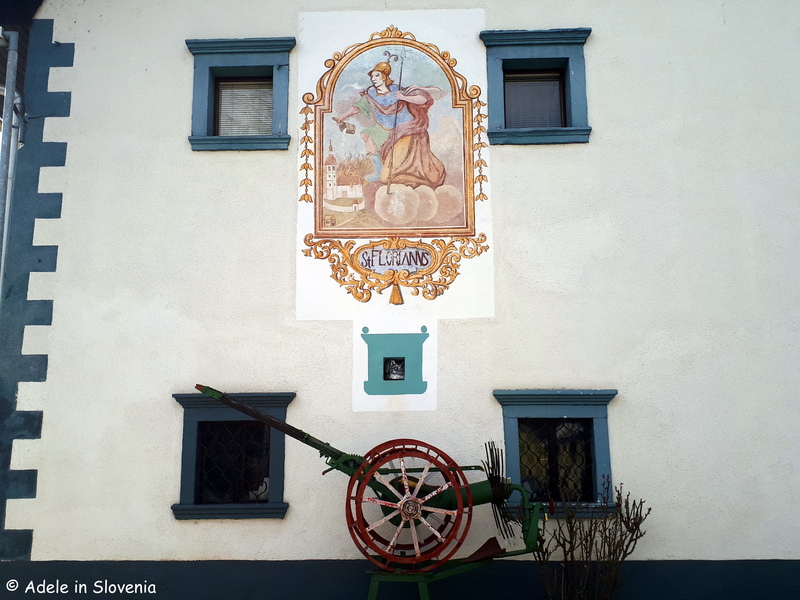 And the Museum of Apiculture, housed in the Radovljica Mansion, houses Slovenia’s largest collection of painted beehives front panels, including the oldest known in the world. Each of the painted panels tells a folk story. So, take time for a linger through Linhart Square, admire the magnificent buildings, and treat yourself or your loved ones to some handmade Slovenian products and/or souvenirs, all in the knowledge that you are helping to support local heritage and traditions and, maybe, hopefully, together we can help to keep those chain stores away from our precious historic towns! 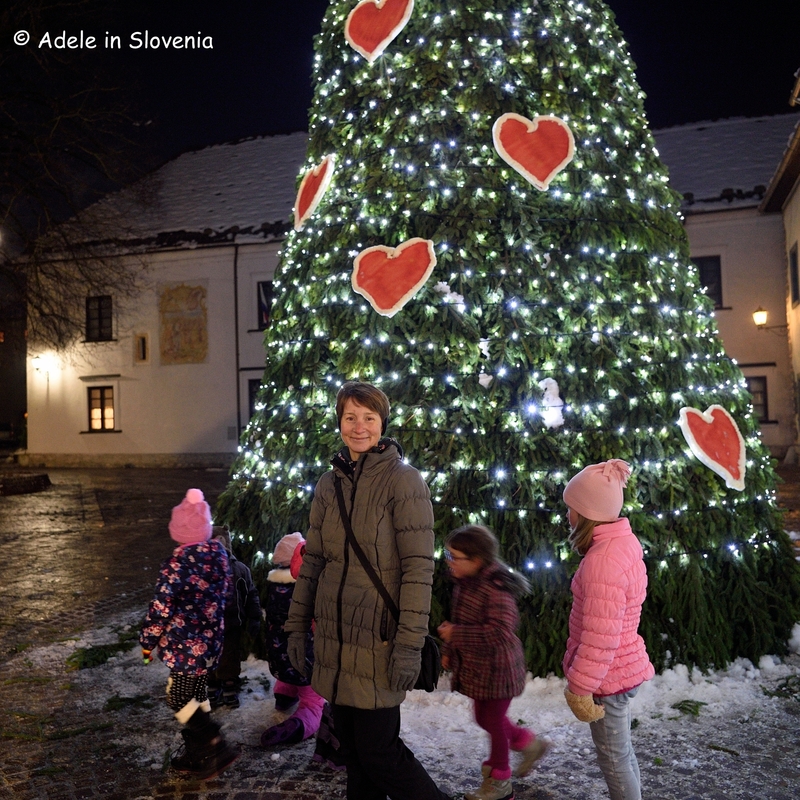 The festive season is upon us and Radovljica’s cute old town centre is looking postcard-pretty. But don’t just take my word for it, take a look at the video below to see more, and/or come and see it for yourself! 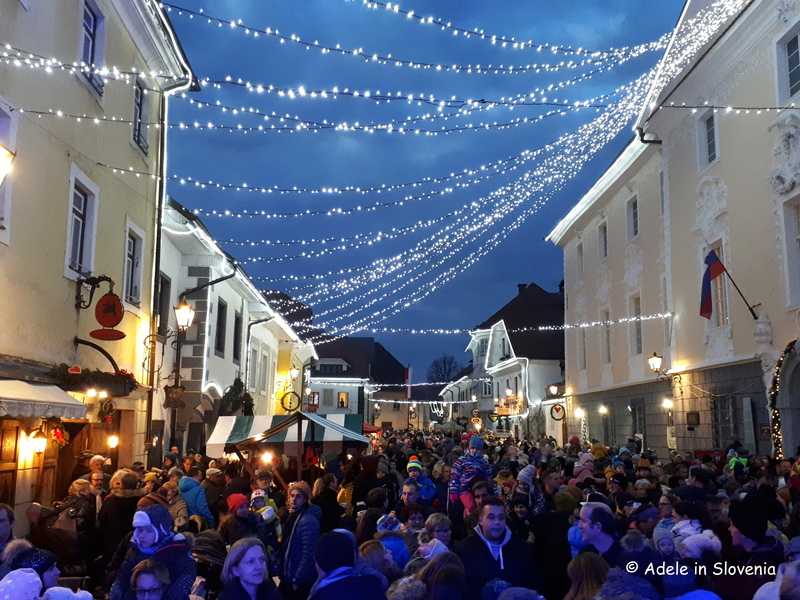 The switching-on of the Christmas lights took place yesterday in Radovljica’s Linhart Square, together with a St. Nicholas market and the closing event of this year’s Taste Radol’ca. 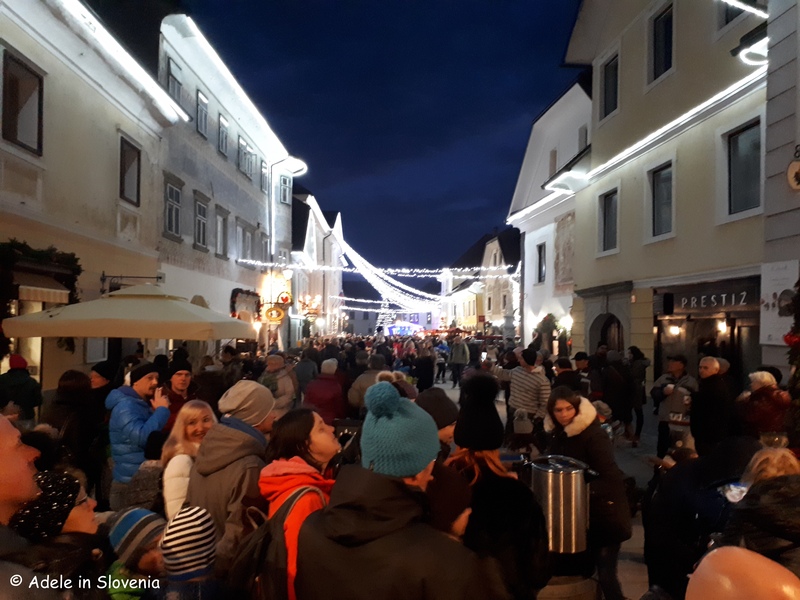 The old town centre was packed full of people eagerly awaiting the official start of the festive season. 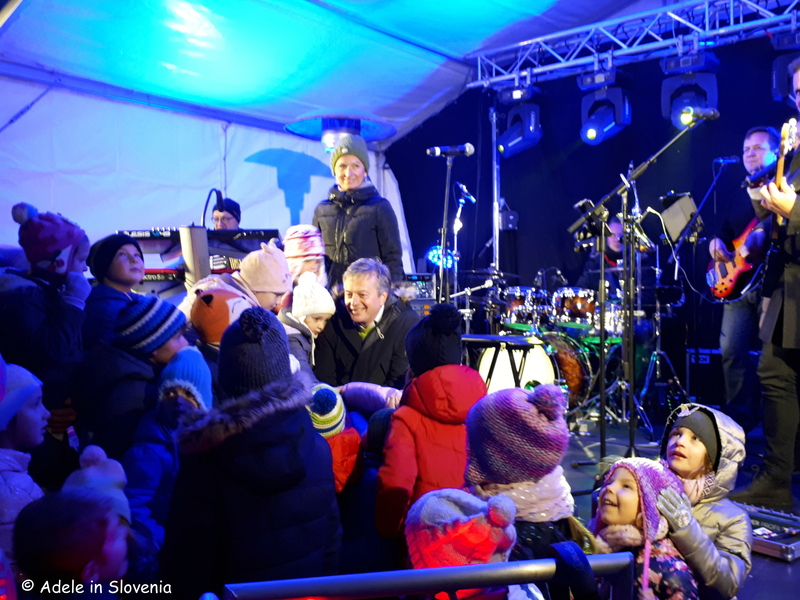 The mayor invited some of the younger among the spectators to help him switch on the lights. And the street food offered by Taste Radol’ca restaurants proved to be a hit too! 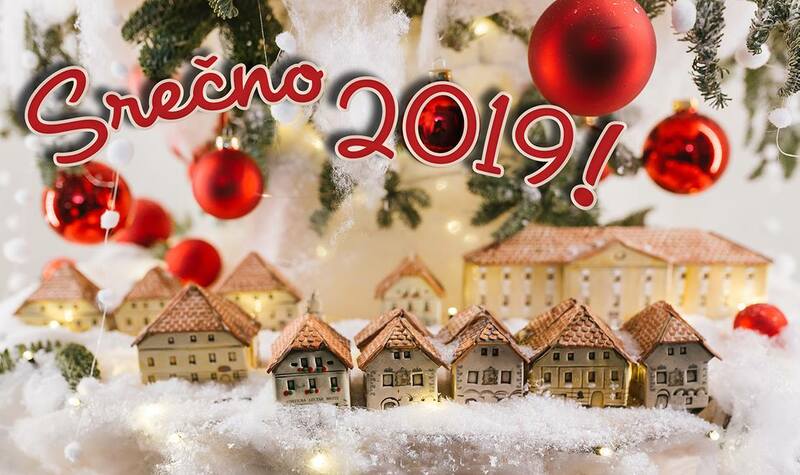 Take a look at the December in Radovljica event calendar to see all the events taking place throughout the festive period. There’s something for all the family including an Advent Market and numerous entertainers and performers in Linhart Square, among them fairytale horses and dogs, the excellent Ana Snežna street theatre, the Čupakabra stilt walkers, Grandfather Frost, young dancers of ballet and other contemporary dances, orchestras featuring pupils from Radovljica Music School, storytellers, shows and workshops for children, and more! 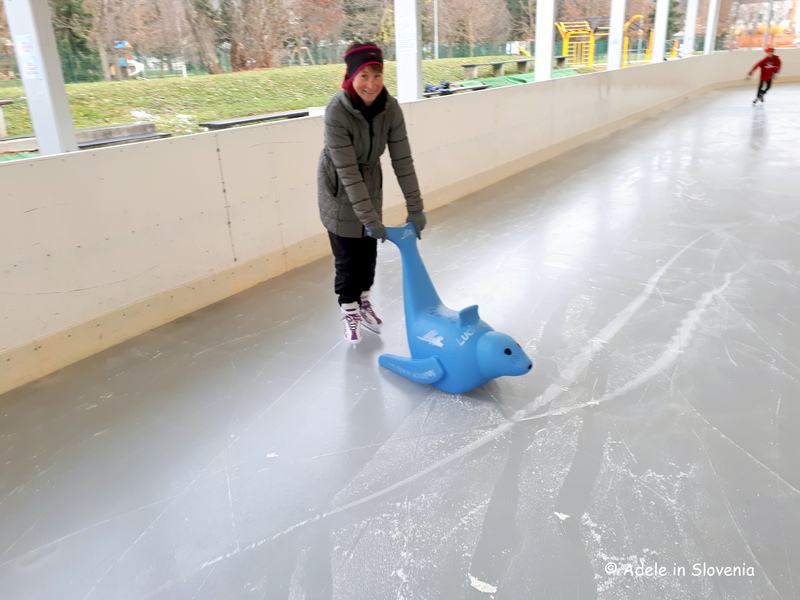 Radovljica’s ice rink officially opened on Friday and will be open throughout the winter from 3pm-6pm midweek and from 10am-6pm at weekends, school holidays and public holidays. Admission for children with their own skates is FREE, while the price is just €2 for adults. Skate hire is available and You can warm up after skating with hot tea and mulled wine from the friendly team at Kofler Sports, who also offer skating courses for beginners (like me!). 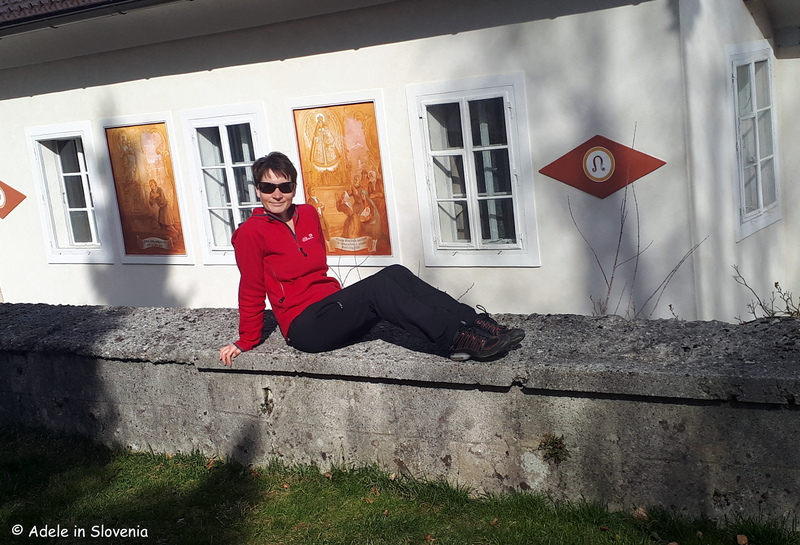 A great way to find out more about Radovljica and see more of its attractions is on the family ‘Find Grandfather Frost’s Postbox‘ orientation adventure. 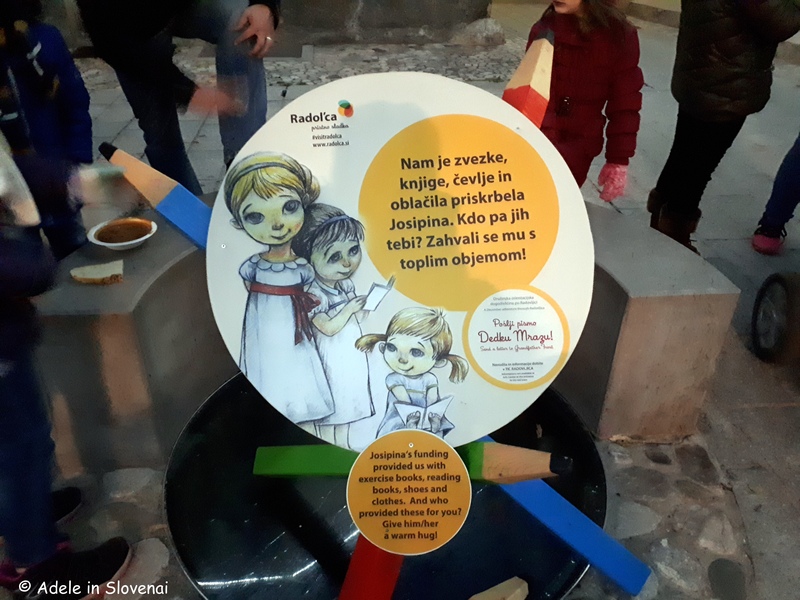 Drop by the Radovljica Tourist Information Centre to pick up a copy of the instruction leaflet then follow the coloured arrows to various points in the old town centre and nearby park. 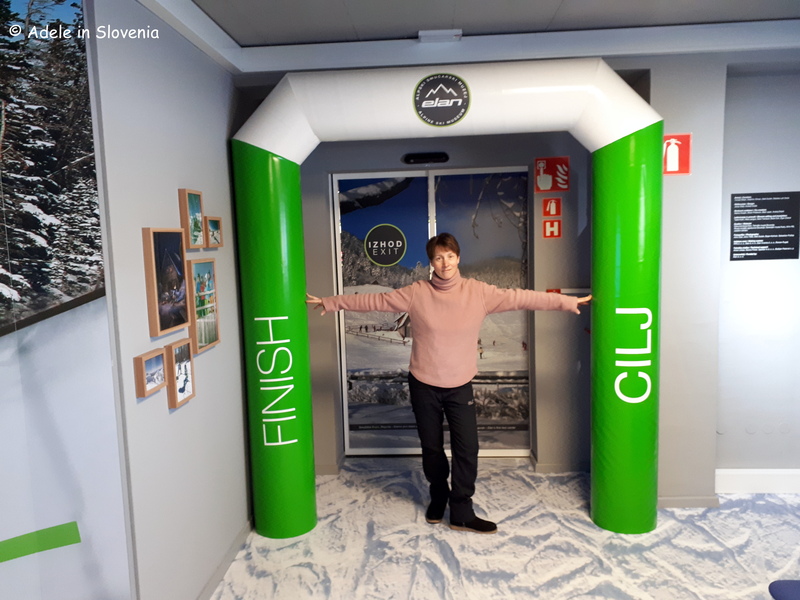 At each interactive point take an interesting, funny and original photograph with your nearest and dearest, and, if you share your photo on the Facebook page of Radovljica’s Tourist Information Centre – @Visit Radol’ca – you could be in with the chance of winning a prize. Tis the season to be jolly, so come on down and join the festive fun! To end, albeit a bit early, Merry Christmas to one and all from me! It may only be the 4th of November, i.e. the start of the Month of Taste Radol’ca, but I’ve already managed to wolf down, or rather ‘savour’, three delicious Taste Radol’ca meals. And all this hardship is in the name of blogging – just for you! Oh dear, I fear it’s going to be a calorific month ahead! 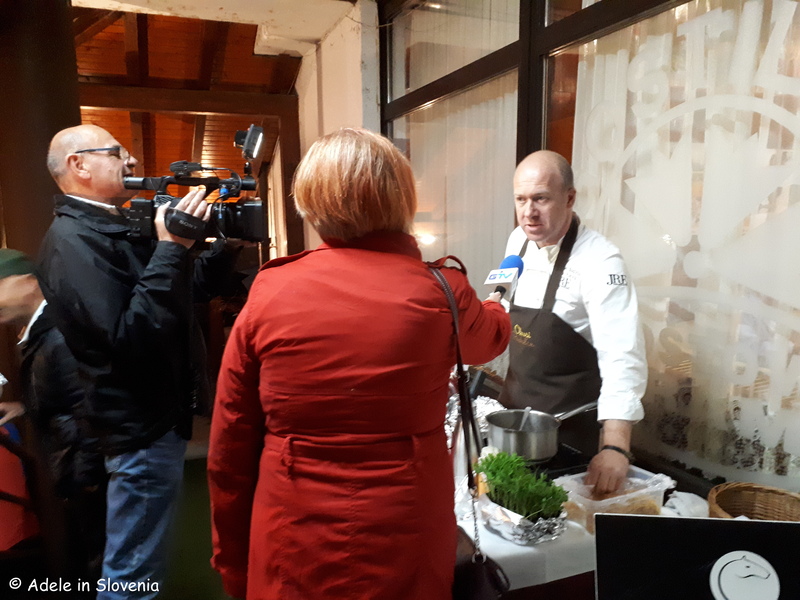 In addition to the opening dinner last Friday at Joštov hram, this week I also enjoyed Taste Radol’ca meals at Gostišče Draga in the Draga valley in Begunje na Gorenjskem and Gostišče Tulipan in Lesce. 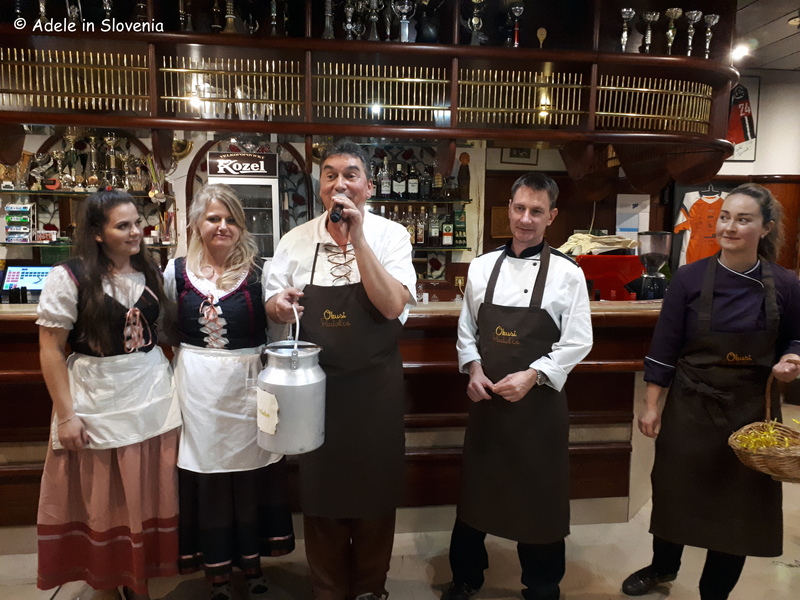 Gostišče Draga never disappoints, be it for a mid-week meal, Sunday lunch, a special occasion, or a Taste Radol’ca meal. 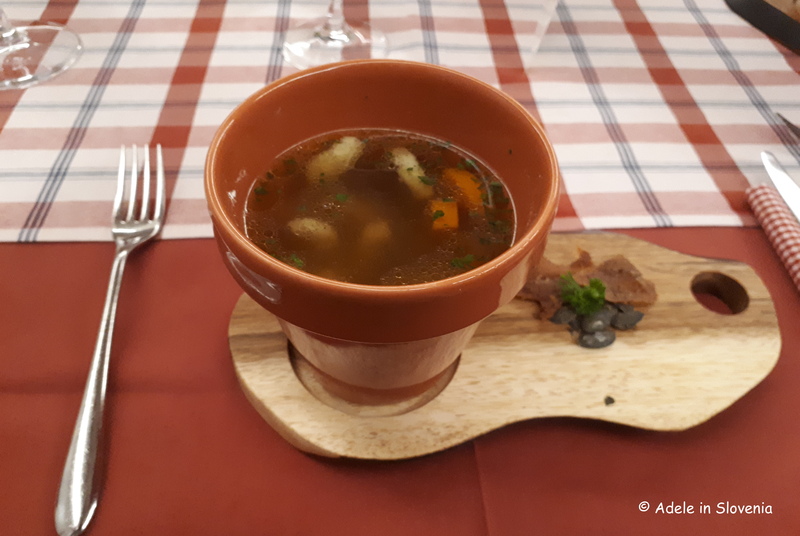 In the years that I have been living in Radovljica, this restaurant has gone from strength-to-strength, and continues to do so. Much of what chef and owner Aleš Tavčar magics up in the kitchen comes from the family farm, so you really know you are getting locally produced food. What they can’t source themselves, they get from local suppliers. My partner in dine (see what I did there?!) 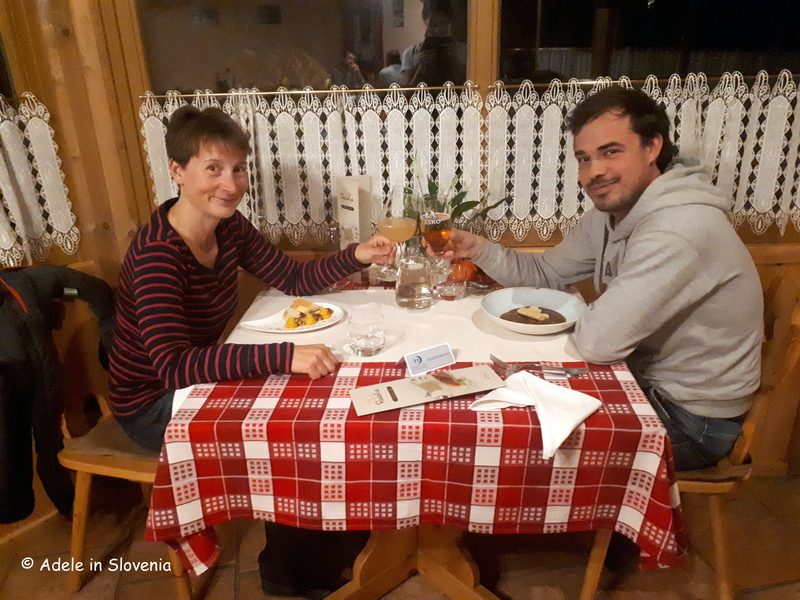 for the evening was Radol’ca’s award-winning beekeeper, Erik Luznar, whose honey can be found in two of the dishes on the Taste Radol’ca menu, so it’s only fitting that he got a chance to try them too! 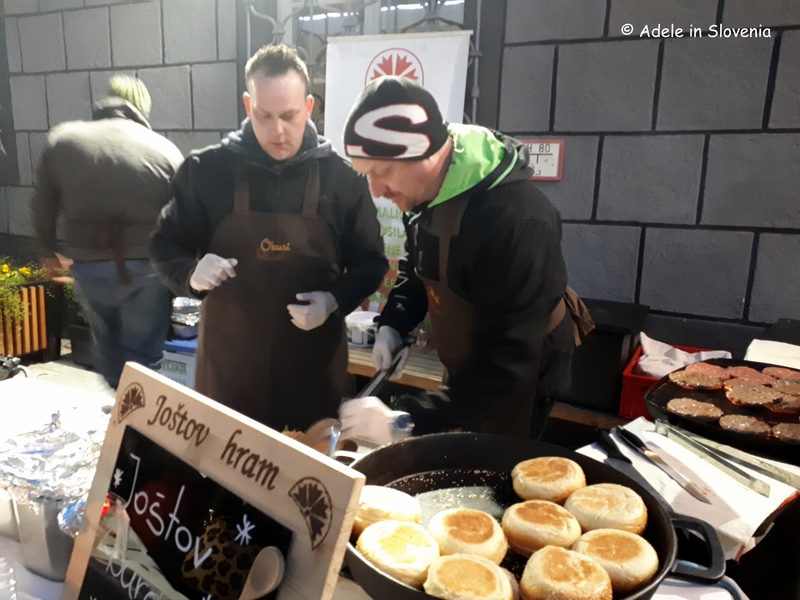 The family-run Gostišče Tulipan in Lesce has long been a staple among locals. 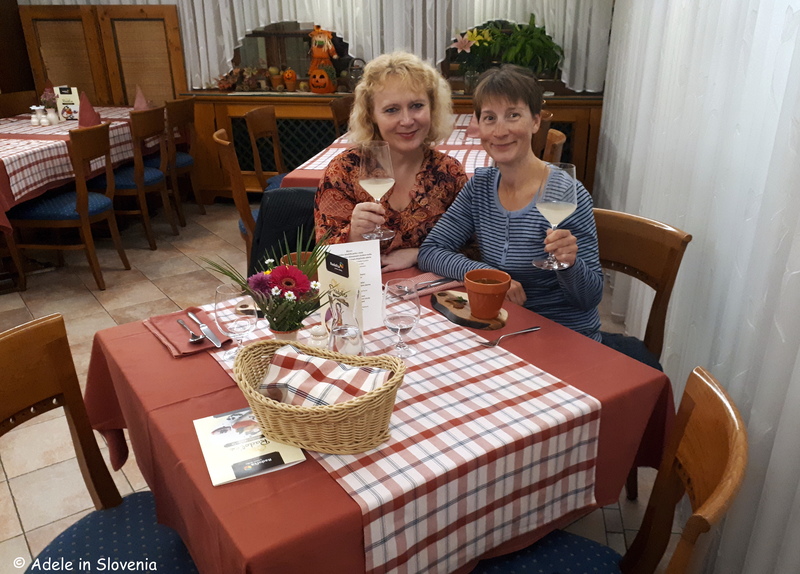 Thanks to its numerous rooms and thus large capacity, it is a particularly popular place to hold various celebrations, but is also just as popular due to its good, honest Slovenian cuisine. The four-course Taste Radol’ca menu is exceptional value. 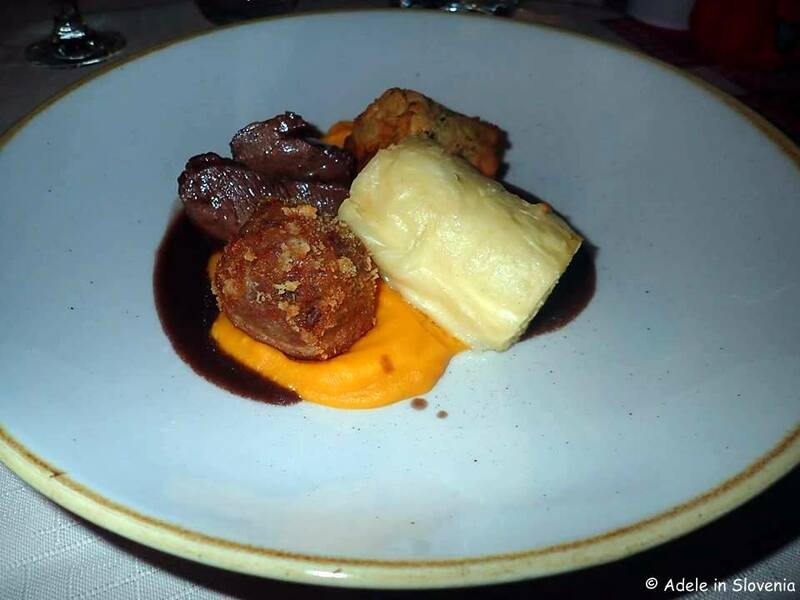 In fact, all Taste Radol’ca meals during the month of November are great value at just €18 for three or four courses. So, that’s three down, six to go, if I don’t burst out of my trousers before then! Browse the menus, take your pick and Taste Radolca – I might just see you there! 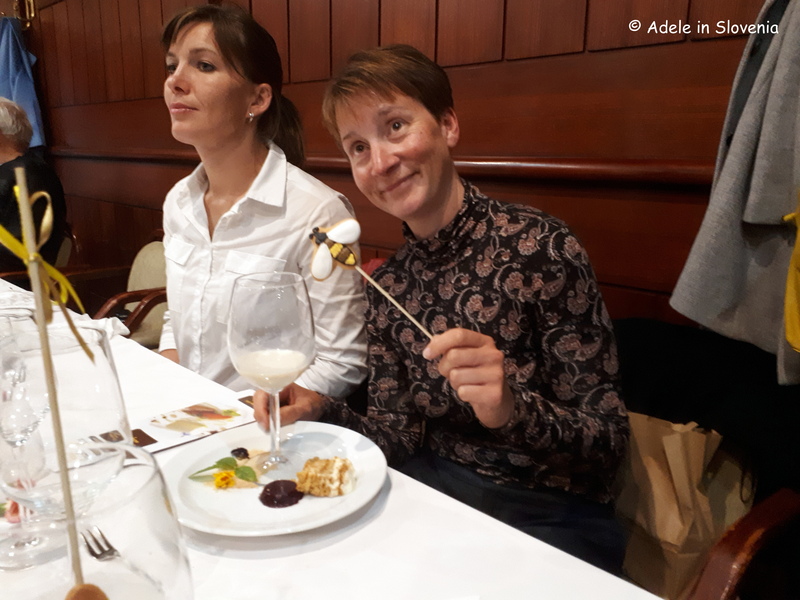 Taste Radol’ca 2018 – a Triumph of Taste and Talent! Last Friday saw the opening event of this year’s Month of Taste Radol’ca. There are 9 restaurants that co-operate in Taste Radol’ca, and every year the opening dinner is held at a different venue. 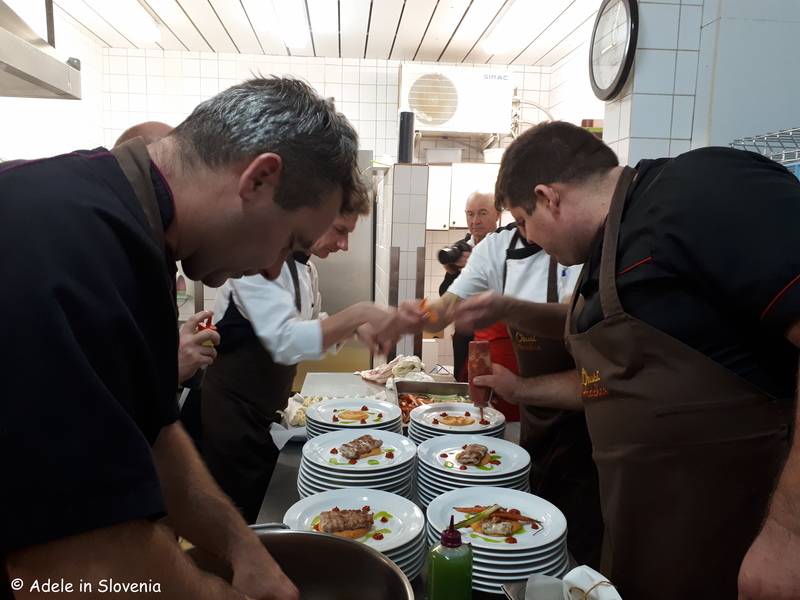 This year it was the turn of Joštov hram in Podnart where, as has become the tradition, all the talented Taste Radol’ca chefs combined their skills, knowledge and creativity, culminating in a unique menu and a wonderful, memorable evening. 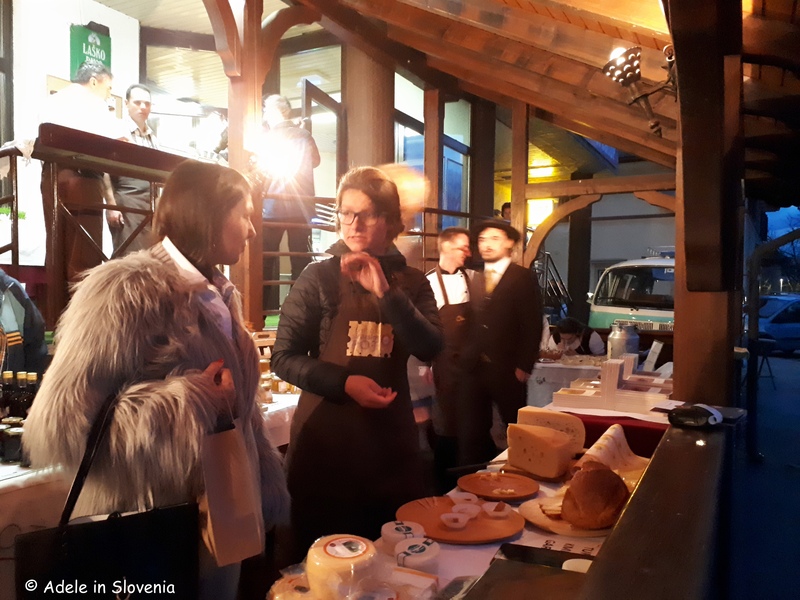 The evening began with a farmers’ market and a chance to meet local producers and try some of their produce and products direct from the farm. And we had a chance to sample a few Taste Radol’ca treats to keep us warm too! 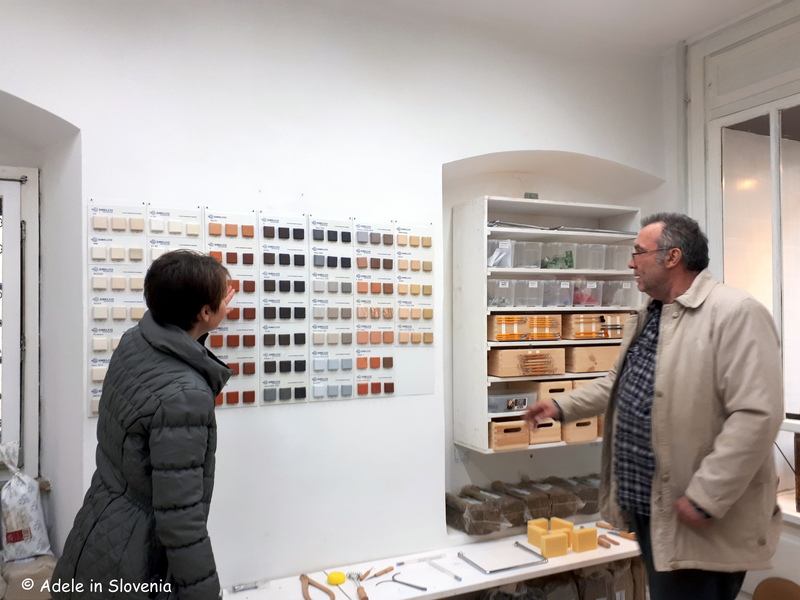 Being home to the Museum of Apiculture and the Beekeeping Education Centre of Gorenjska, the Radol’ca area is synonmous with beekeeping and the theme of this year’s Taste Radol’ca is honey. 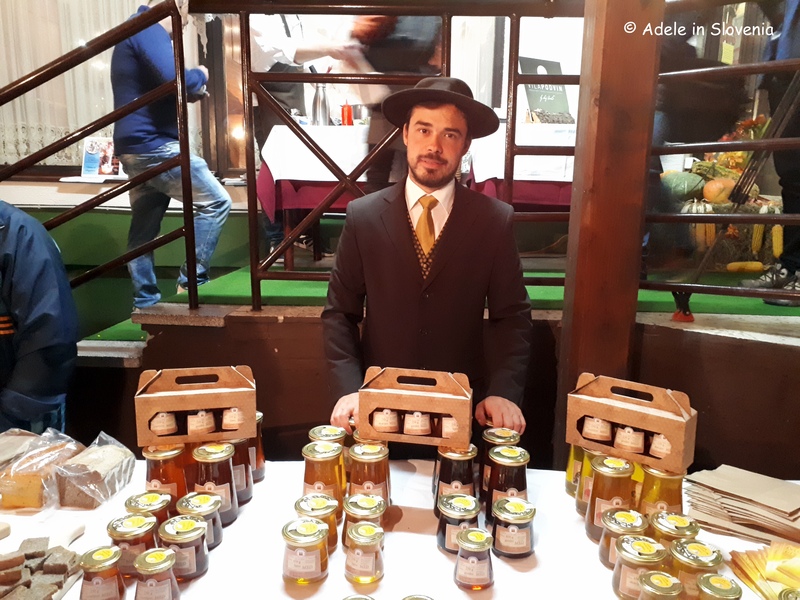 The Radol’ca area is home to numerous beekeepers, among the most well-known is Erik Luznar of Čebelarstvo Luznar, whose acacia honey was recently judged the best in the country – congratulations Erik! 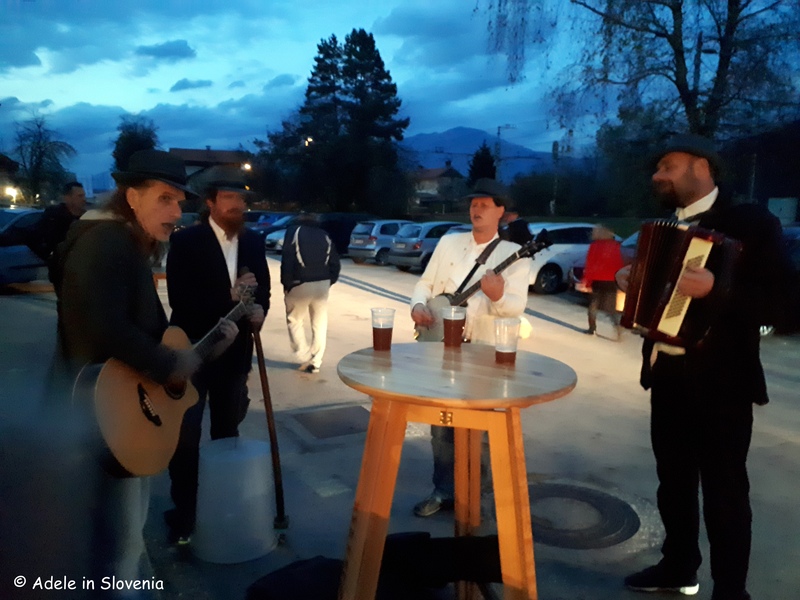 Throughout the evening music was provided by the excellent band Suho cvetje, who first played outdoors as a backdrop for the farmers’ market, and then moved indoors. Their unique style of music was just perfect for such an intimate venue, not overpowering and the perfect compliment to the jovial atmosphere. At 7pm it was time for the main event, and we were ushered to our tables to let the feasting begin! The whole focus of Taste Radol’ca is that all dishes are prepared using exclusively local ingredients, thus supporting local farmers and producers and ensuring an absolute minimum number of food miles. The other essence is that everyone mucks in, there are no egos at play here, it’s a case of ‘all hands on deck’ as all the chefs work in harmony with spectacular results. 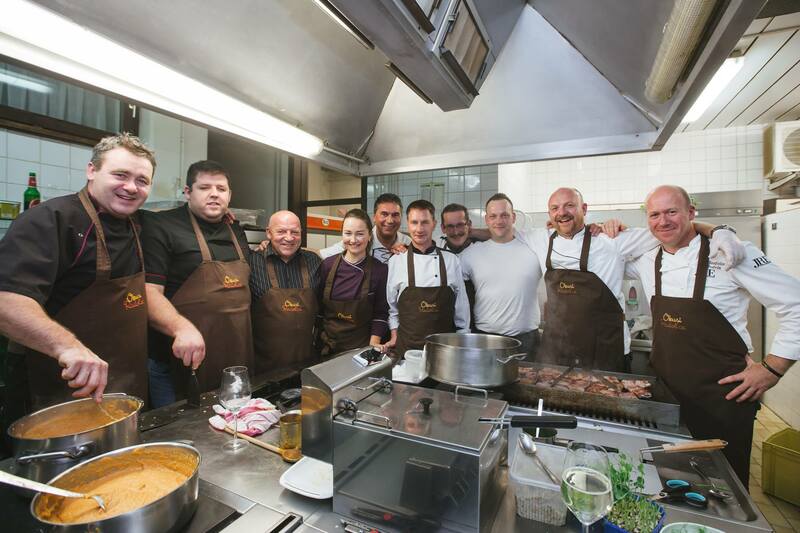 In addition to joining forces in the kitchen, the chefs, as well as restaurant owners and staff, all muck in too! 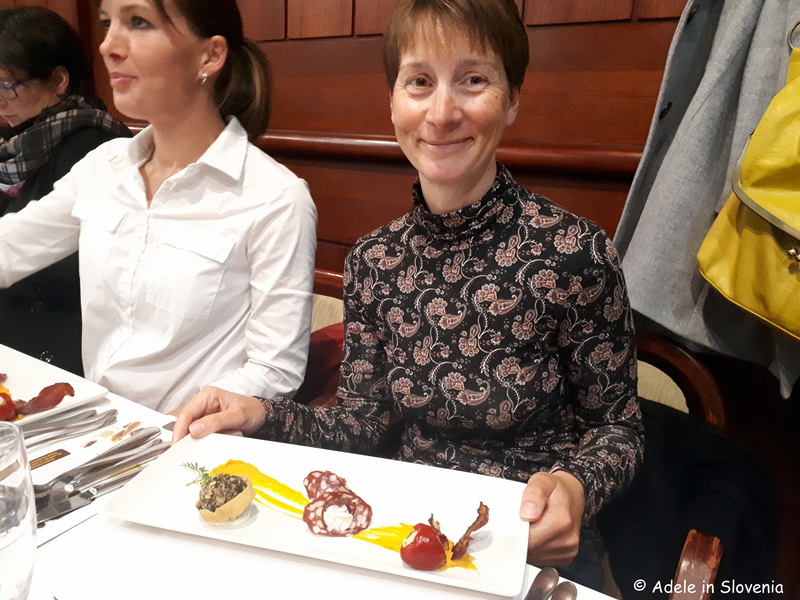 We began with a cold starter consisting of game pate, salami, hummus, pumpkin and mini peppers, prepared by Gostišče Draga and Gostišče Tulipan. 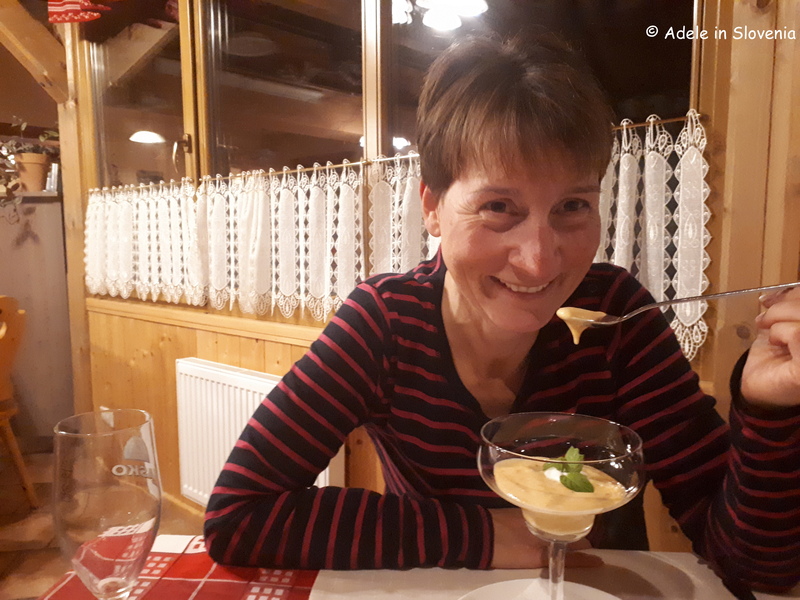 The soup was a particular treat for me – parsnip soup – parsnips are very rarely seen in supermarkets and almost never on the menus of restaurants, so bravo Vila Podvin and Lambergh Restaurant for using this wonderful vegetable! 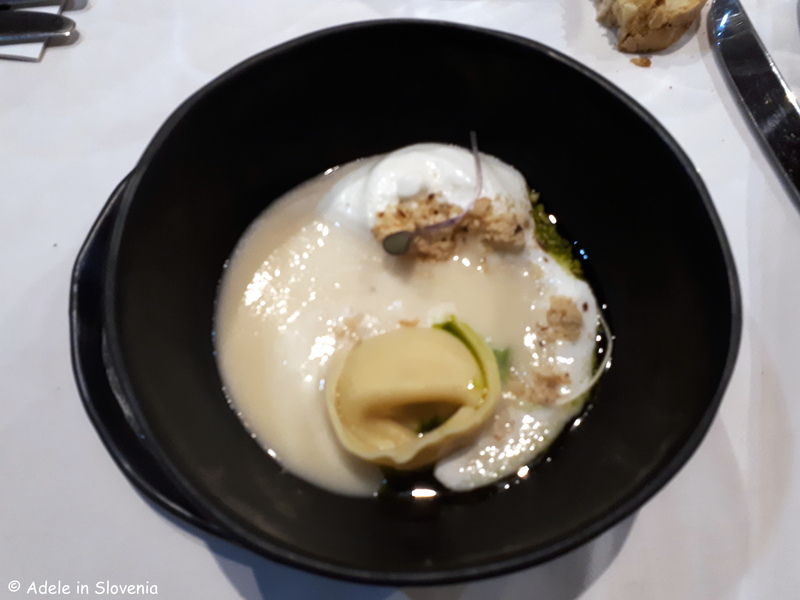 It was served with tortellini filled with mohant cheese – a distinctively pungent and whiffy cheese from the Bohinj area – served with hazelnuts, yoghurt and honey. 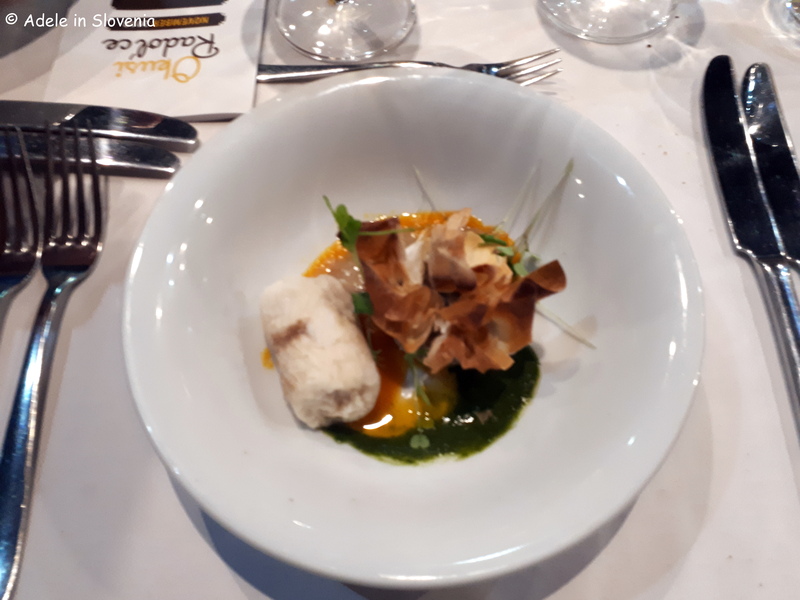 The hot starter was porcini mushrooms, from beneath Roblek, with locally-farmed trout and spinach, prepared by Gostilna Avguštin and Gostilna Pr’Tavčar. 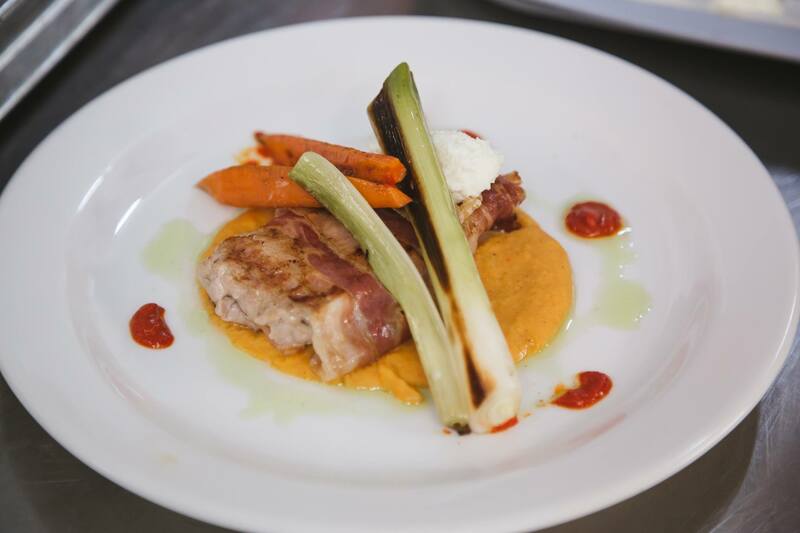 The main course, courtesy of Joštov hram, Gostilna Kunstelj and Gostilna Lectar, was a mouthwatering combination of Kraskopolje pig wrapped in bacon with bean puree, roasted pepper sauce and spring onions. With a nod to this year’s theme of honey, dessert, the brainchild of Gostilna Kunstelj and Gostilna Lectar, featured honeyed milk with a bee-shaped honeybread to dunk served with succulent honey cake. 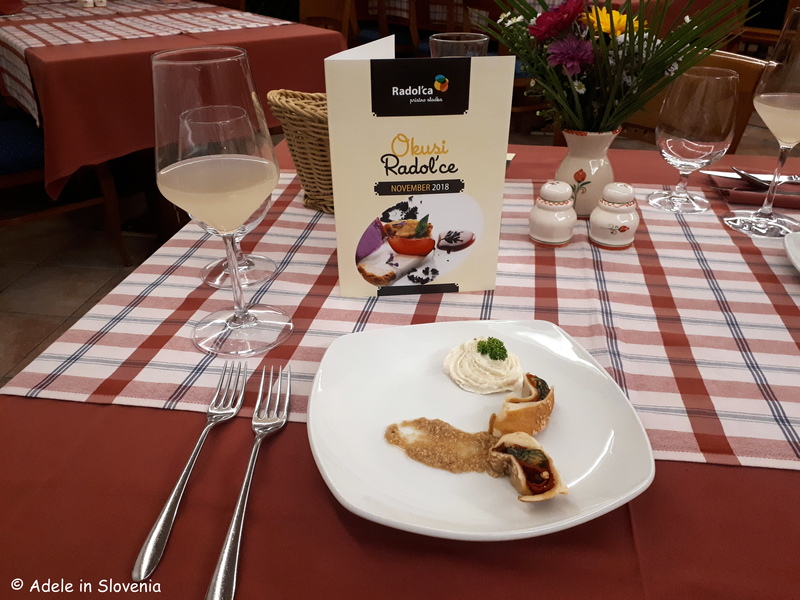 And this is but the start, there is still the whole month of November ahead to enjoy meals at all the 9 Taste Radol’ca restaurants – Joštov hram, Gostilna Avguštin, Gostilna Lectar, Gostišče Draga, Gostilna Pr’Tavčar, Lambergh Restaurant, Vila Podvin, Gostilna Kunstelj and Gostišče Tulipan. And to give you even more incentive, if you visit at least 5 restaurants by the end of November and collect a stamp at each one, you will receive two vouchers for food at the Taste Radol’ca closing event, which will take place on 1st December together with the switching-on of the Christmas lights and the opening of the Advent Market. I hope this has whetted your appetite to try more – I know it has mine; Taste Radol’ca here I come! Check out the menus here to help you decide where to go (first)! 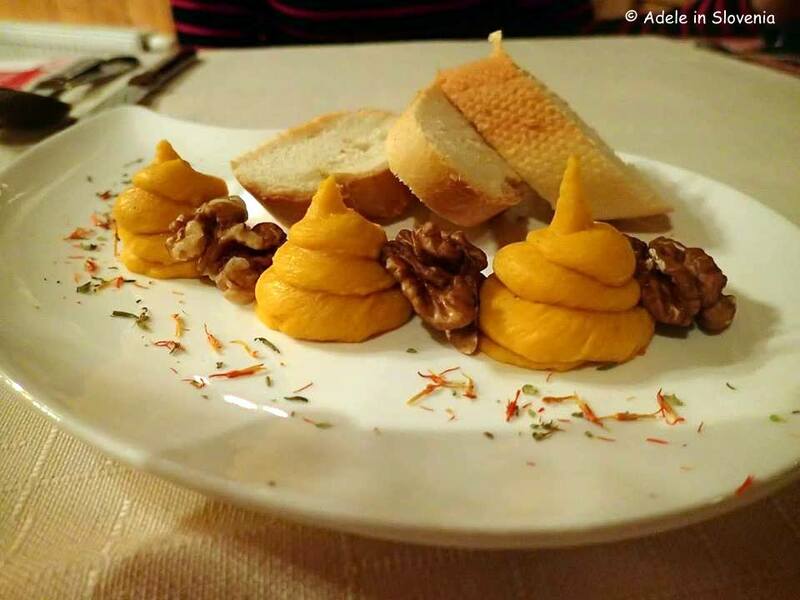 Autumn Time is Tasty Time in Radol’ca – Taste Radol’ca! Autumn, thus far, has been a very mixed bag! There have been some beautifully warm, sunny days, but also some bitingly cold, crisp mornings, with the first frost already on 25th September – the coldest September morning since 1977, whereas last year it was exactly a month later, on 25th October, when it was time to start scraping the ice of the car windscreen! However, some things about autumn are stalwarts, among them the magnificent colours of nature and tasty food in Radol’ca! 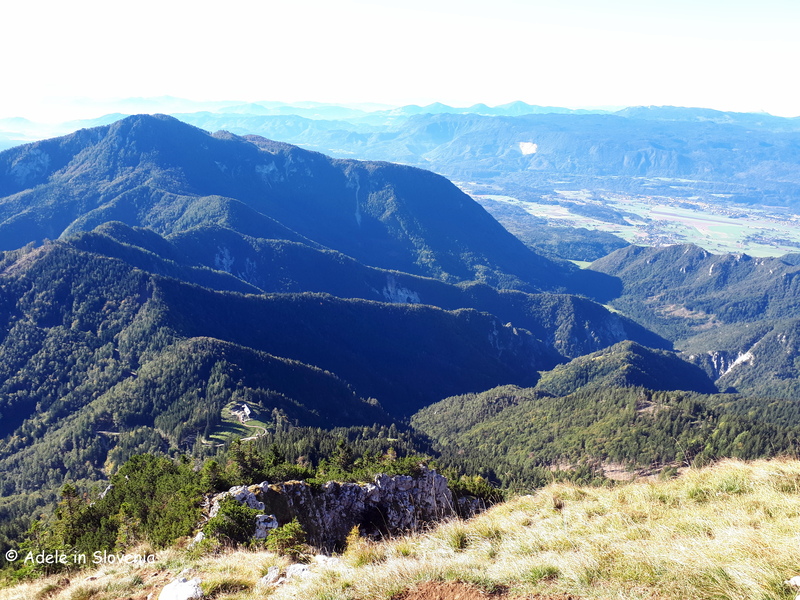 Hiking in the Radol’ca area, and in particular in the Karavanke mountains, is wonderful in autumn, especially if you set off on one of those pleasantly warm days, as was the case on my hike last week to Begunščica (2,060m) from the Draga valley, when the views and visibility were quite astounding. 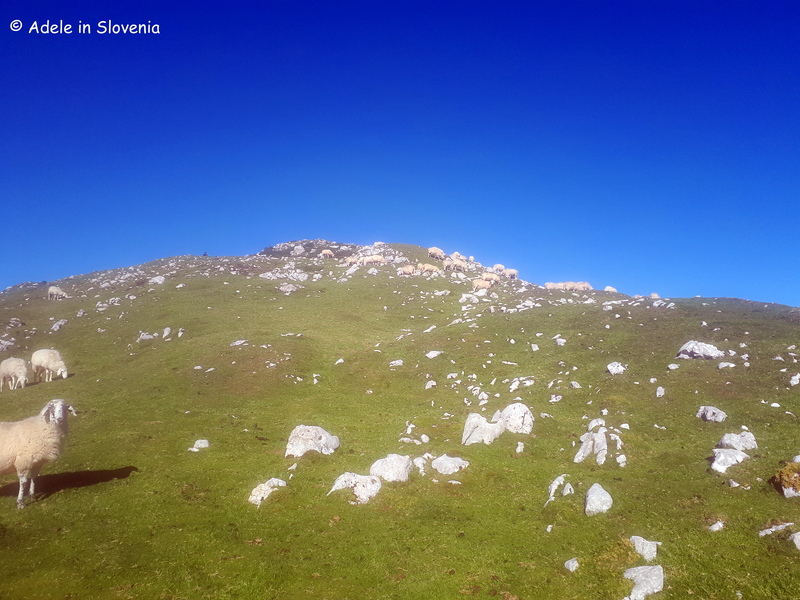 Even the sheep grazing just beneath the peak looked happy that the sky was so blue – and, trust me, no photo-shopping was required, it really was that blue! And since all that hiking works up and appetite, on to the subject of food – my other great love! 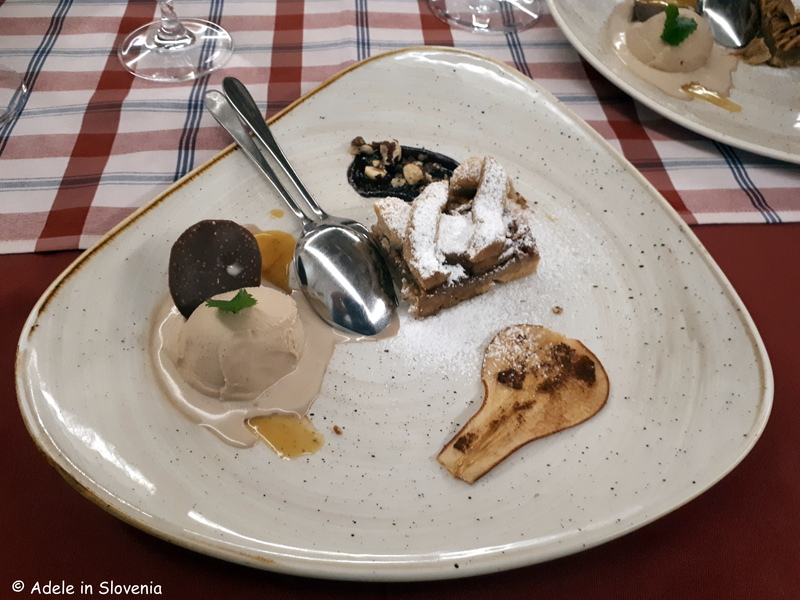 Restaurant Week takes place bi-annually, in spring and in autumn, and makes dining at some of Slovenia’s finest restaurants accessible and affordable to all. All restaurants that are part of Restaurant Week are assessed and have to meet strict criteria to be included, therefore, the fact that there are three Taste Radol’ca restaurants – Vila Podvin, Gostilna Kunstelj, Lambergh Chateau and Hotel, included in the 19 restaurants in northern Slovenia, is a sure testament to the quality of Taste Radol’ca. This year 100 restaurants are taking part in Spring Restaurant Week and from 12th – 21st October will offer fixed menus for just €18 per person. Reservations are essential, and many of the restaurants get booked up early, so don’t delay, book today! In addition, the whole month of November is a celebration of the best of Taste Radol’ca, with all the nine participating Taste Radol’ca restaurants offering special fixed price menus for just €18. This year’s opening event will take place on Friday 26th October at gostilna Joštov hram in Podnart. The evening will begin at 5pm with a farmers’ market, followed by the opening dinner at 7pm. 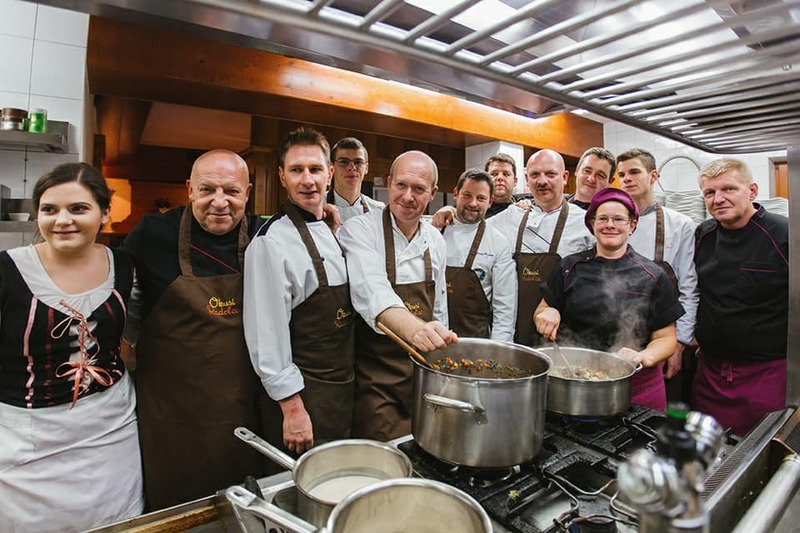 As in previous years, all the talented Taste Radol’ca chefs will combine their skills, experience and creativity to create a unique and memorable dinner. 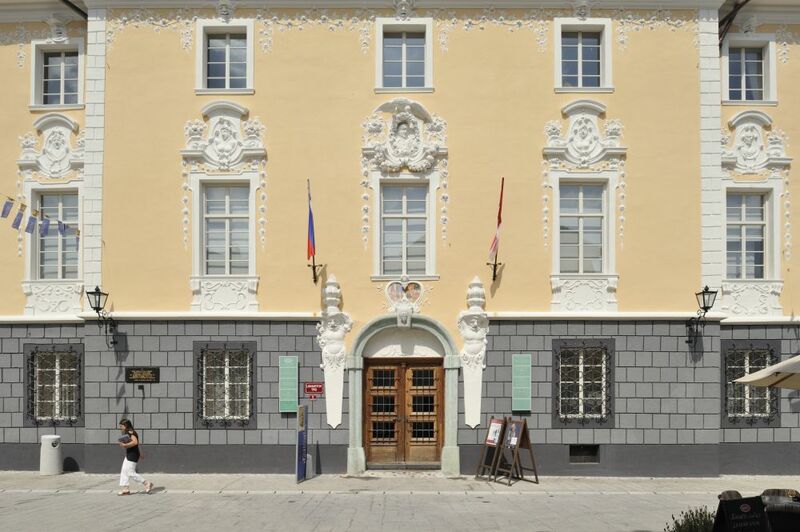 Reservations can be made from 8th October at the Radovljica Tourist Information Centre. The price of the opening dinner is €39.00 (drinks excluded). The theme of this year’s Month of Cuisine is honey. 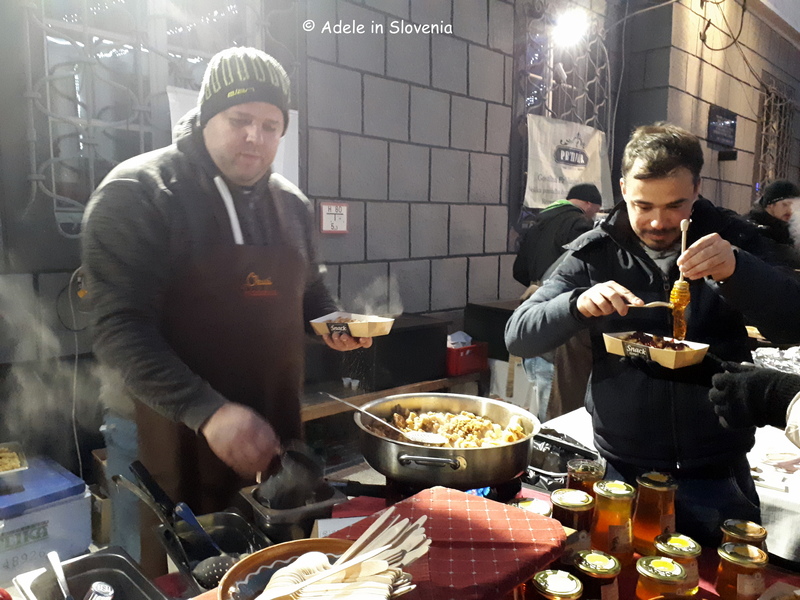 Radovljica, as the beekeeping capital of Slovenia, and in the year when World Bee Day was first celebrated, will also end the year on a culinary-based bee theme. I’m looking forward to seeing what inventive menus the chefs will be cooking up for us this year, and I might, just might, blog about it too! © Adele in Slovenia. Unauthorised use and/or duplication of this material without express and written permission from this site’s owner is strictly prohibited. Hurry on Down to Chocolate Heaven at the 8th Radovljica Chocolate Festival!